The crafters who come to our getaways are so talented!! 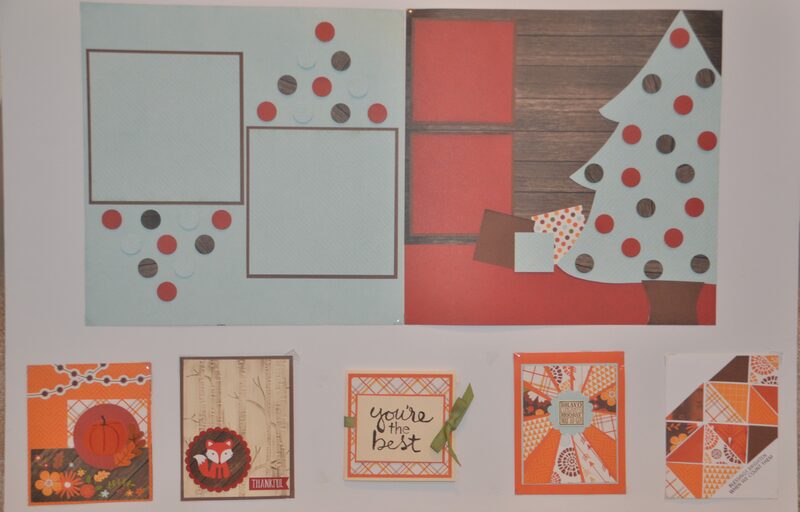 Here are some of the cards they brought as part of our card exchange, Shoebox Swap…Enjoy! Here it is! Another inspiration to feed your creative spirit! This is another project I scrap lifted from something I saw online. I love the mix of colors and patterns, including how the design goes across both pages. 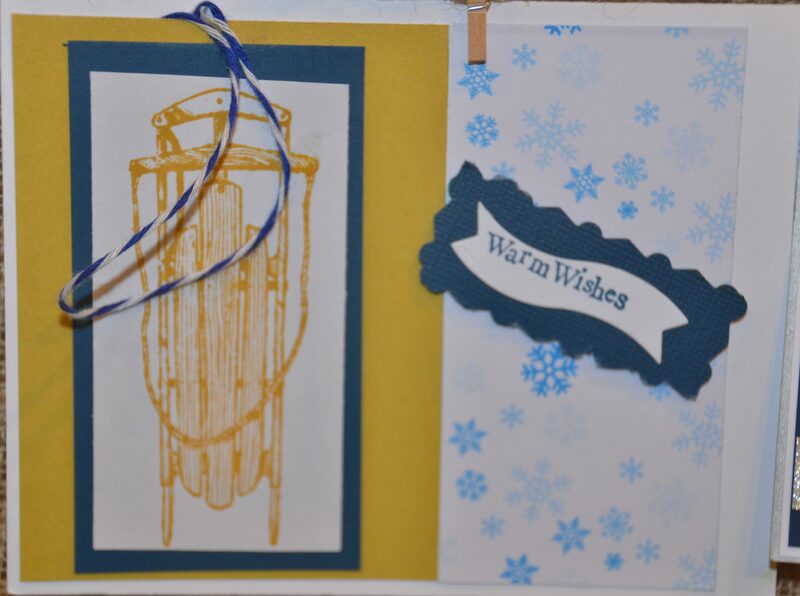 The sentiment inside the card: “I think you’re brilliant!” Notice the gold thread behind the light bulb. It mimics the filament inside a real bulb. What a fun detail! I love the combination of banners, colors, and dimension. 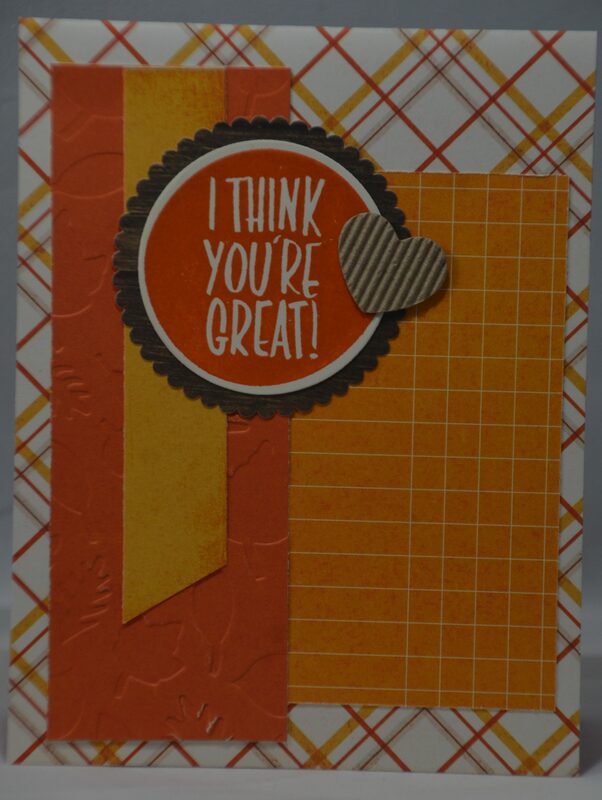 This is a great card to show someone how much you appreciate them! 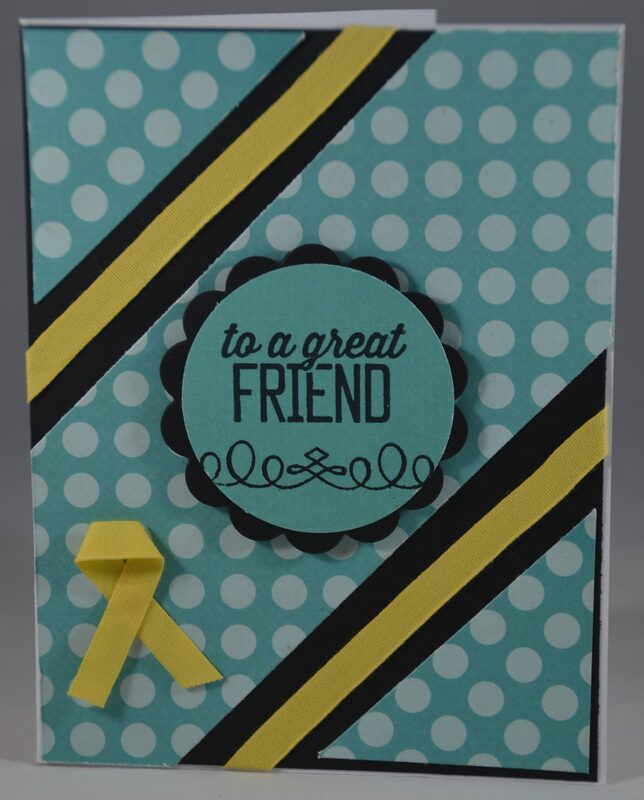 When I saw this dotted chevron paper, I was excited to pair it with another bold pattern. 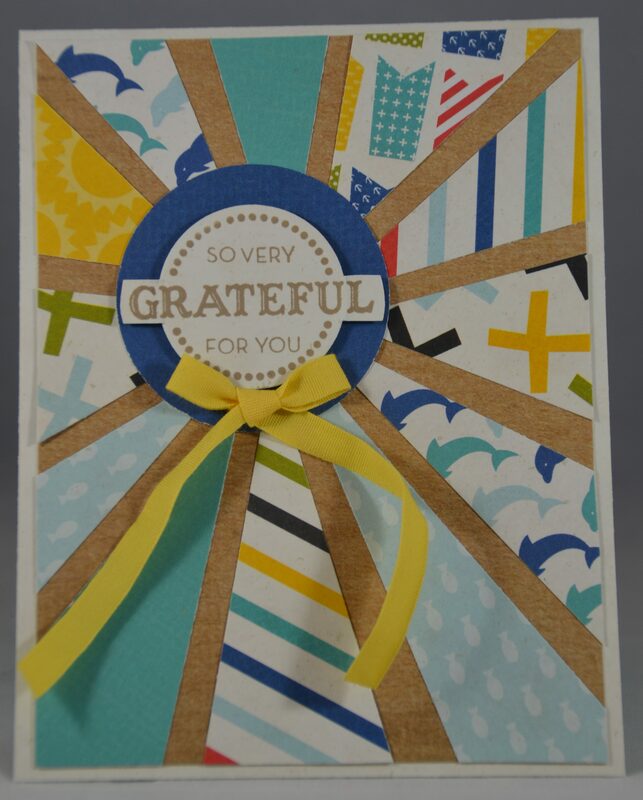 This is a fun way to incorporate different colors and patterns, even using up extra scraps you may have! You’ll see more fall inspiration, coming soon! Welcome to the last edition of our Fall 2017 Inspiration Board projects…Happy Fall! 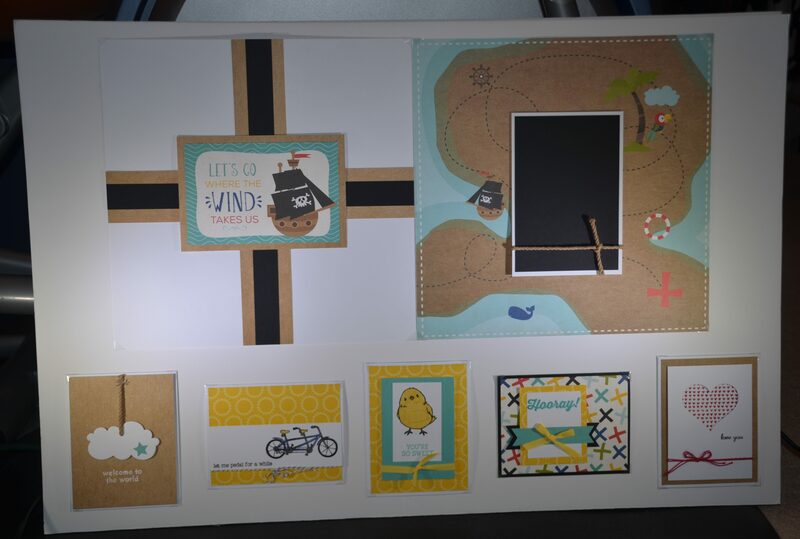 Patterned paper scares me, but we have a lot of patterned paper, so I chose to make a layout with as much of it as I could. 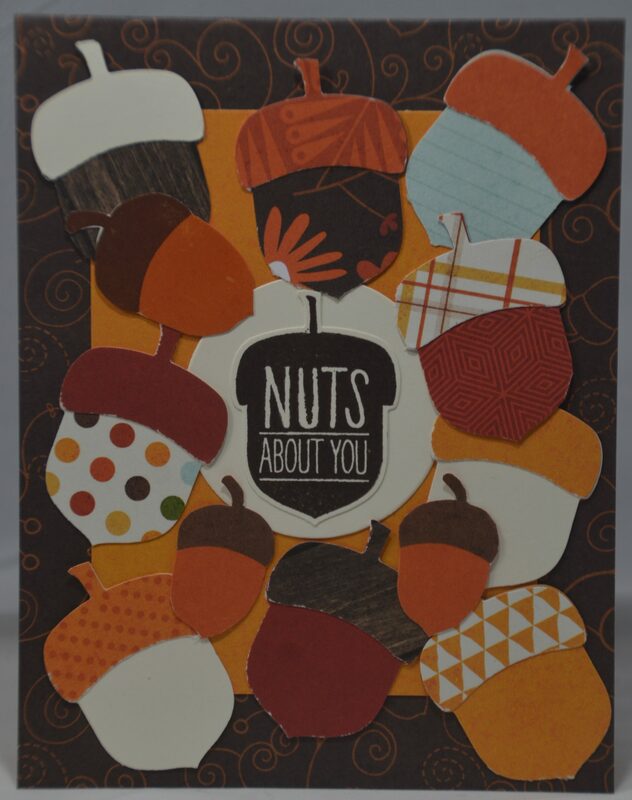 Using a fall theme and acorns, this layout features just a few of your favorite fall pics. 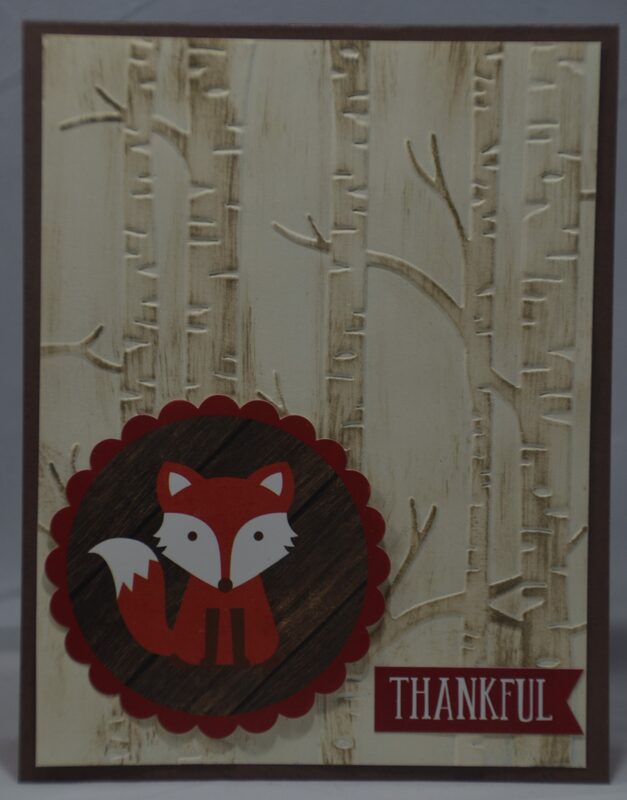 The fox is created using a die cut and I just had to use it for one of my projects! His facial expression spoke to me and I decided to feature him in a Get Well card. 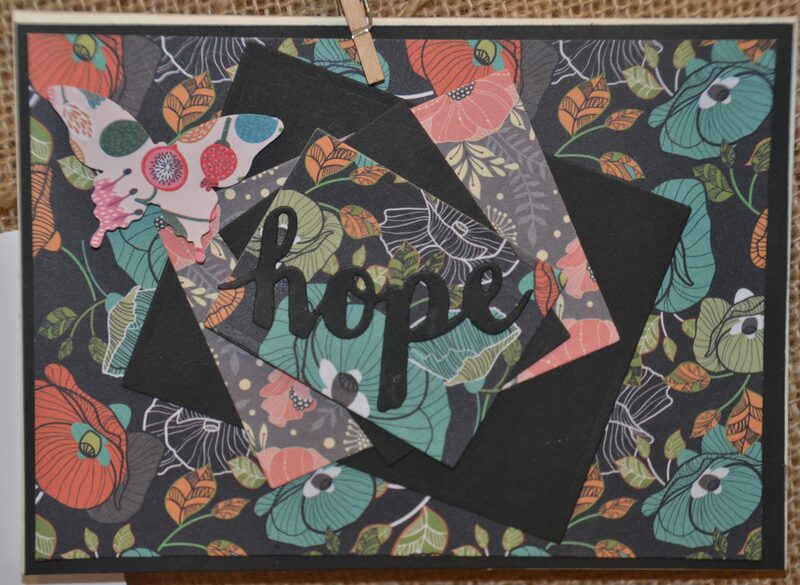 I just purchased a Tim Holtz die cut and wanted to feature it. Adding the butterfly seemed to be a natural fit. I challenged myself to use as many different patterned papers as possible. 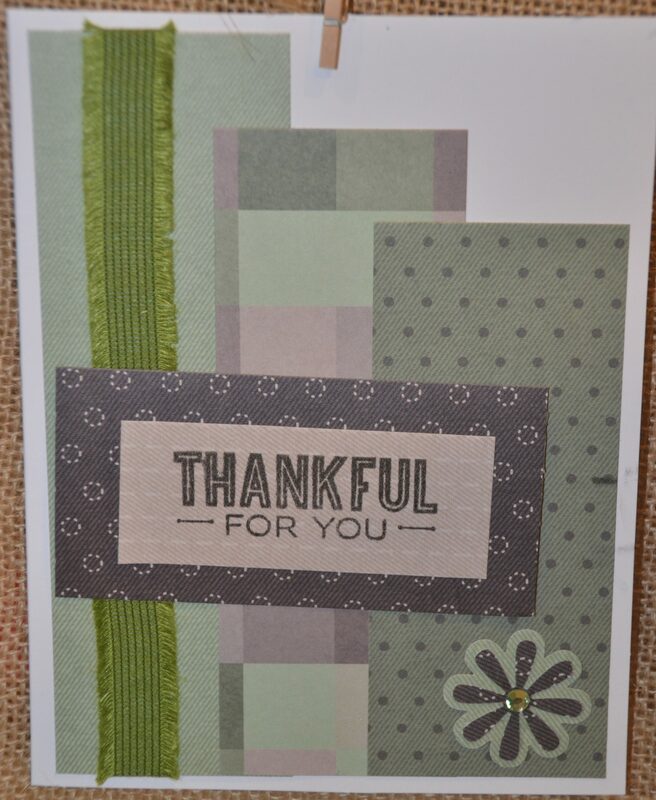 I love how this came together with the solids, and added a simple sentiment to complete it. I wanted to use the ruler paper and didn’t know how. The sentiment, “You Rule,” just fit naturally. 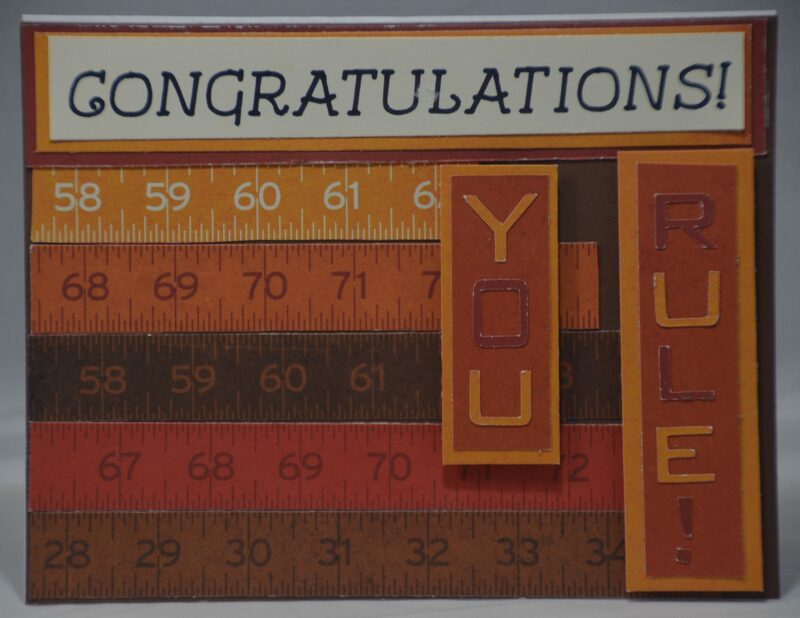 I had difficulty finding a stamp sentiment for “Congratulations,” so I chose to use my Cricut machine and marker to customize this component. 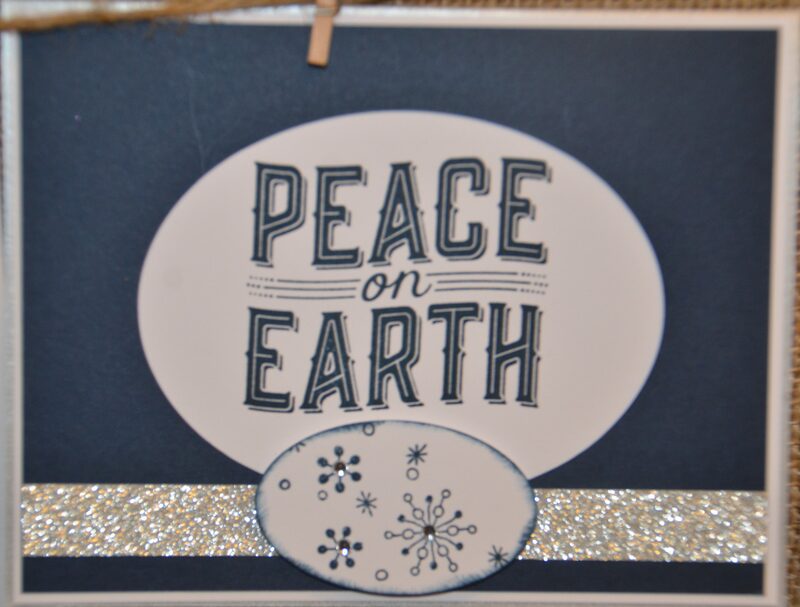 I had the tree stamp and wanted to incorporate it into one of my projects. 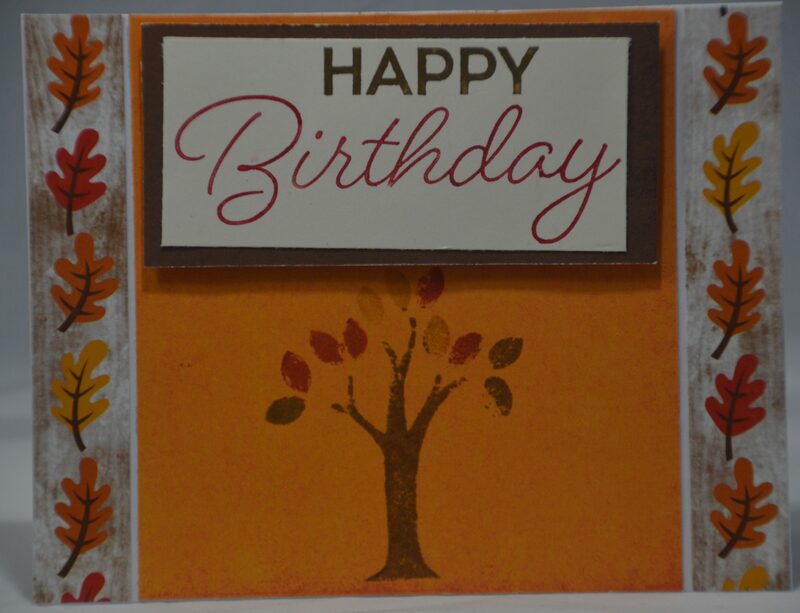 The leaves in the paper coordinated well with the theme and the ink colors pull it all together. Thanks so much for following our projects…we can’t wait to share our next theme with you soon! Here’s the newest installment of our Fall Inspiration Boards…Enjoy! When I saw this beautiful fall layout, I knew I had to replicate it. Not knowing exactly how to make the leaf cutouts, I made a stencil, laminated it, and went from there. 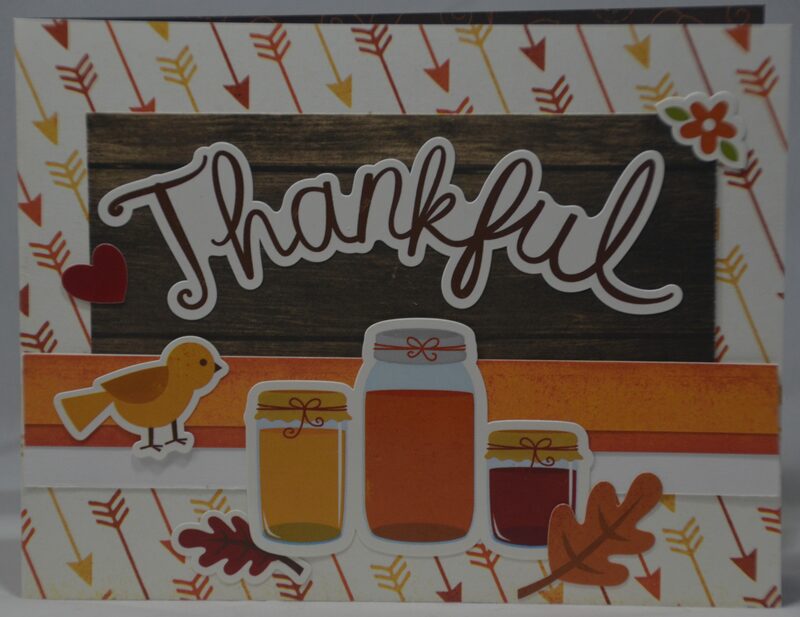 I also love how the tags that spell “Thankful” spill from one page to the next! 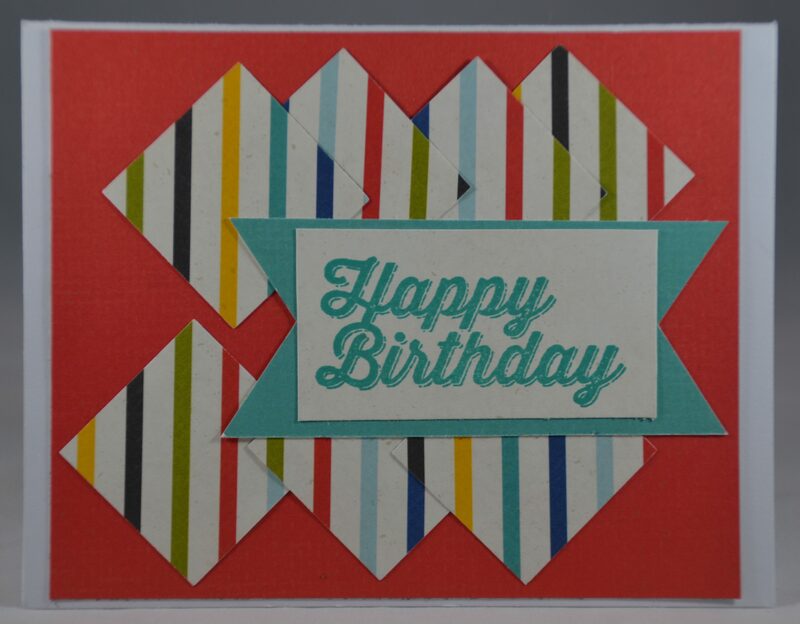 This is one of the quickest cards I’ve ever made. I love how the patterns work together to create a warm feeling. 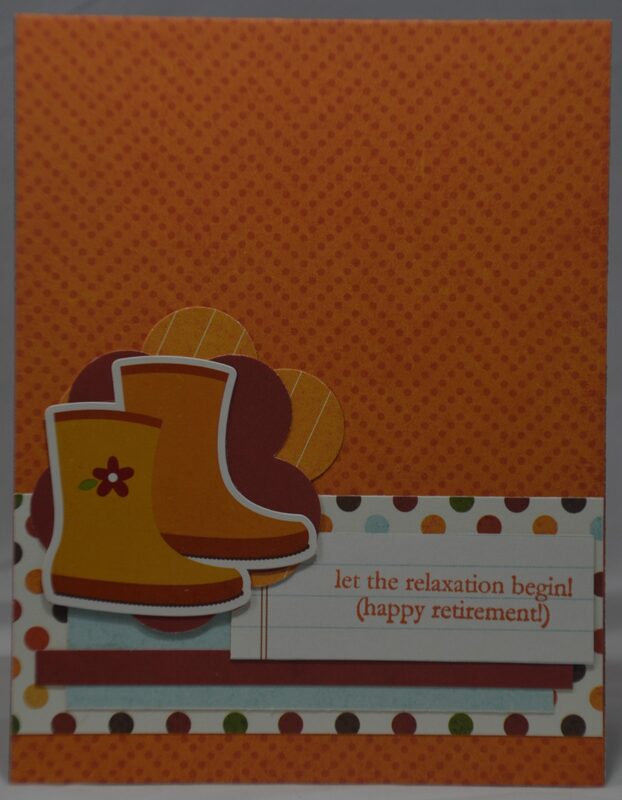 This is the first retirement card I’ve ever made and I kind of love it! When I think of retirement (haha! 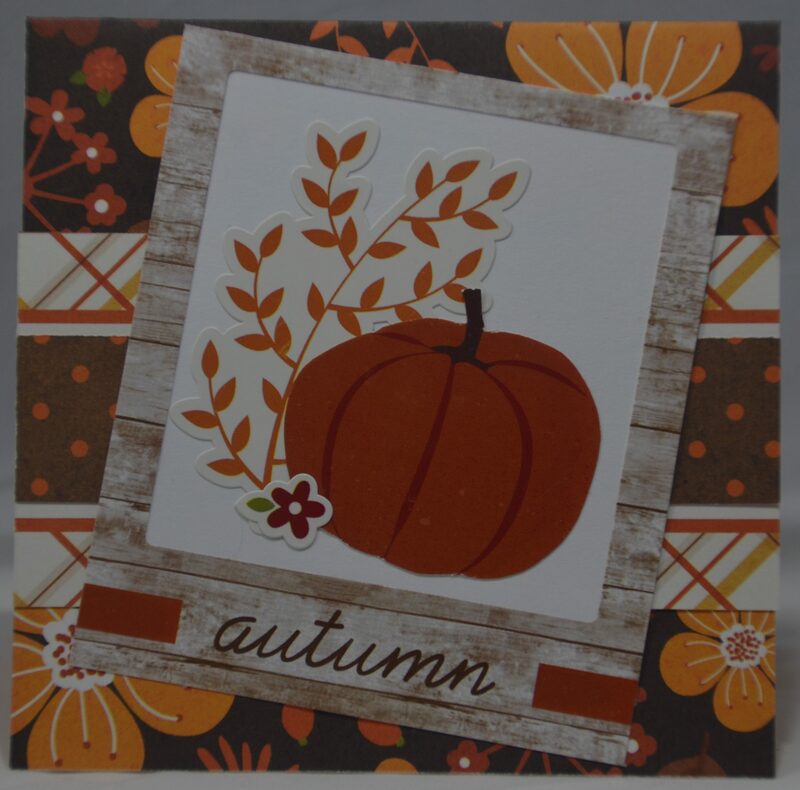 ), I envision moving at a slower pace, enjoying the fall colors, and splashing in puddles! Twist and Pop! 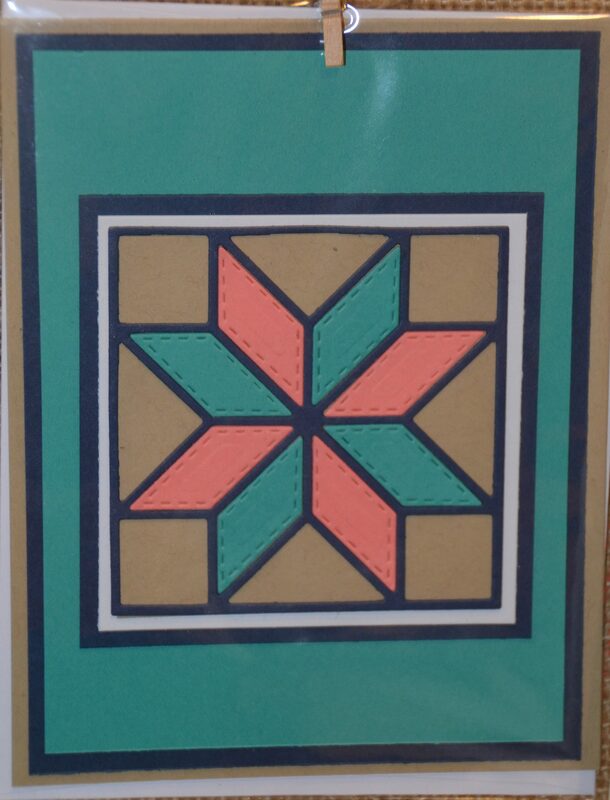 This unique folding card will surprise you when opened. The middle section literally twists and pops out, revealing more space to enjoy! While easy to create, it makes a big impact! I am a sucker for good puns and this one “cracks” me up! Who doesn’t love a good mason jar image? 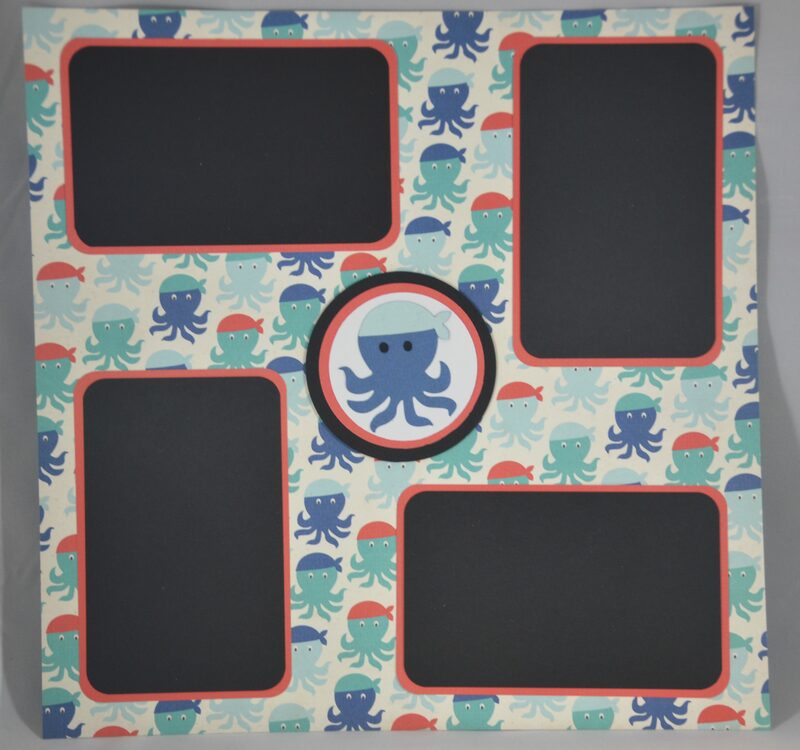 This one is full of them and is simple to make using coordinated stickers. 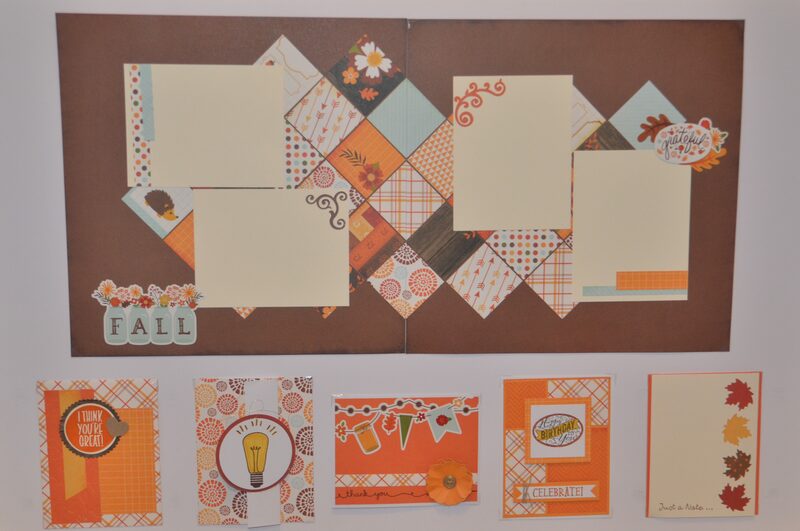 Coming soon…the next fall inspiration spread :). 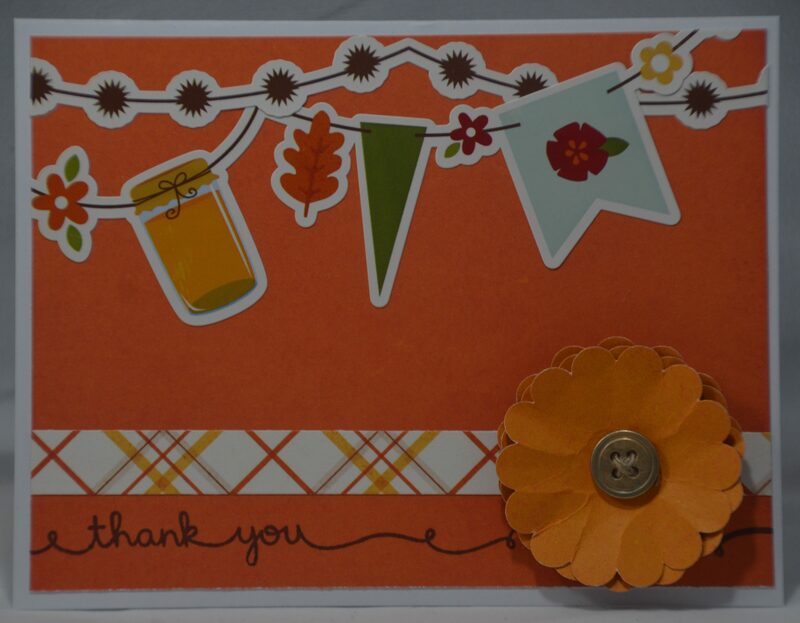 At our Fall Getaway, our theme and welcome gift was all about FALL!! 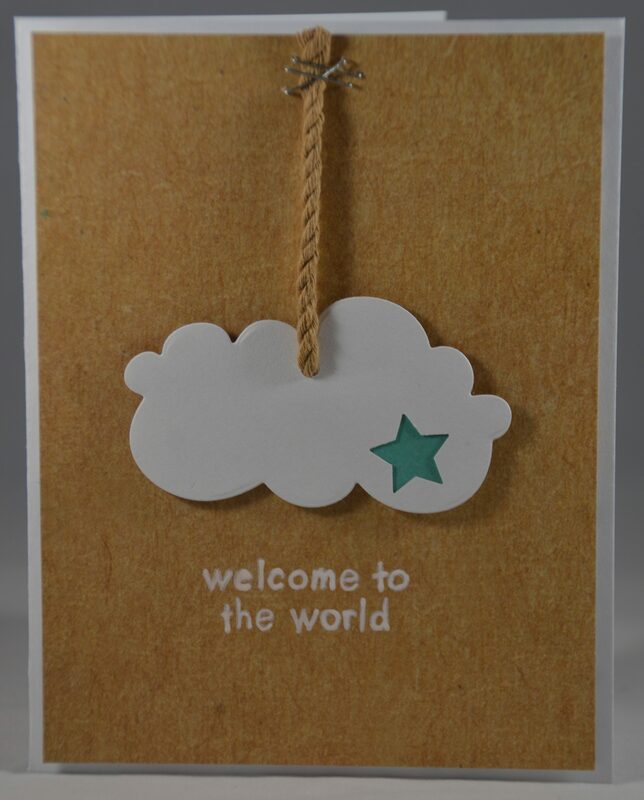 Over the next few months we will be sharing our Inspiration Board projects we created with paper and embellishments from the welcome gift. We hope you enjoy! 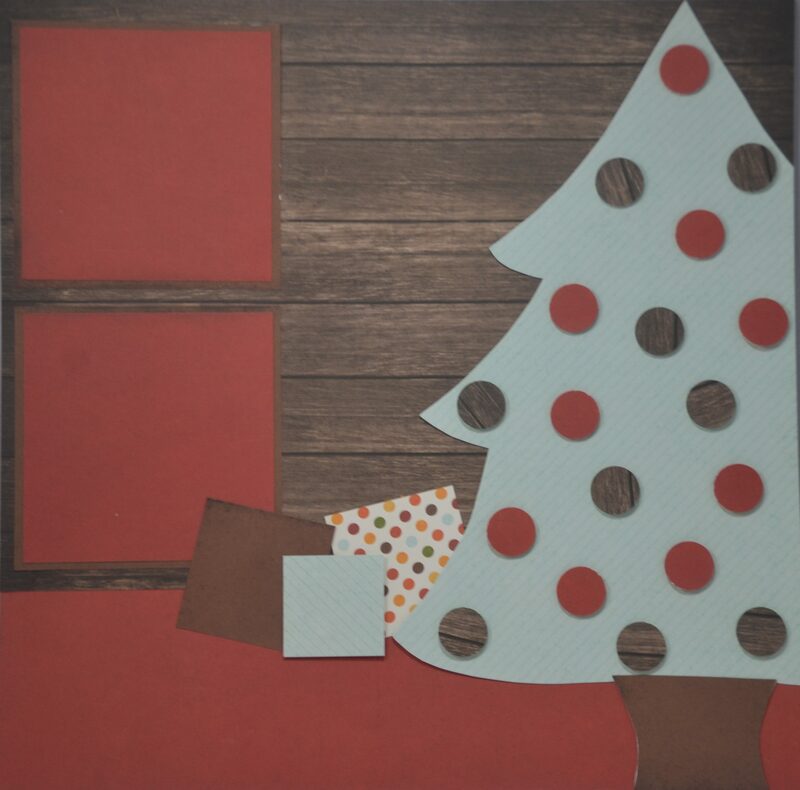 I have recently been challenging myself to do Inspiration Board projects that are not correlated with the paper theme…so why not make a holiday layout with fall paper?!?! 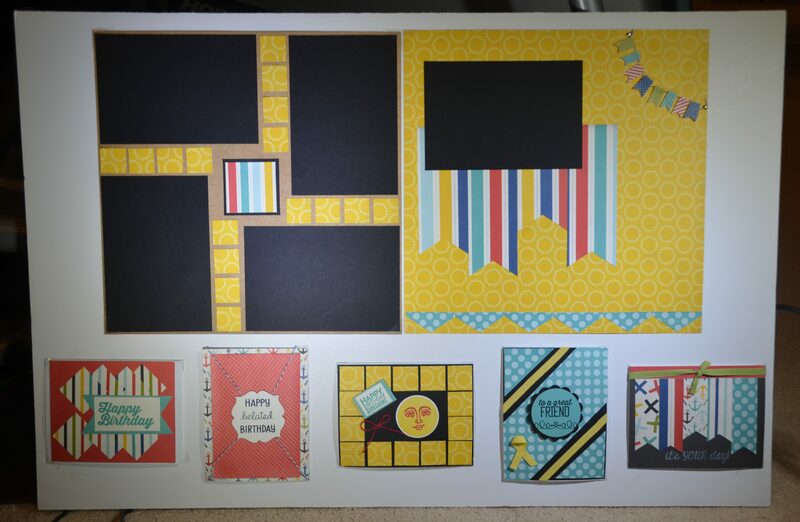 This layout provides a fun, simple way to showcase your holiday photo memories. This was a fast, easy card to put together. 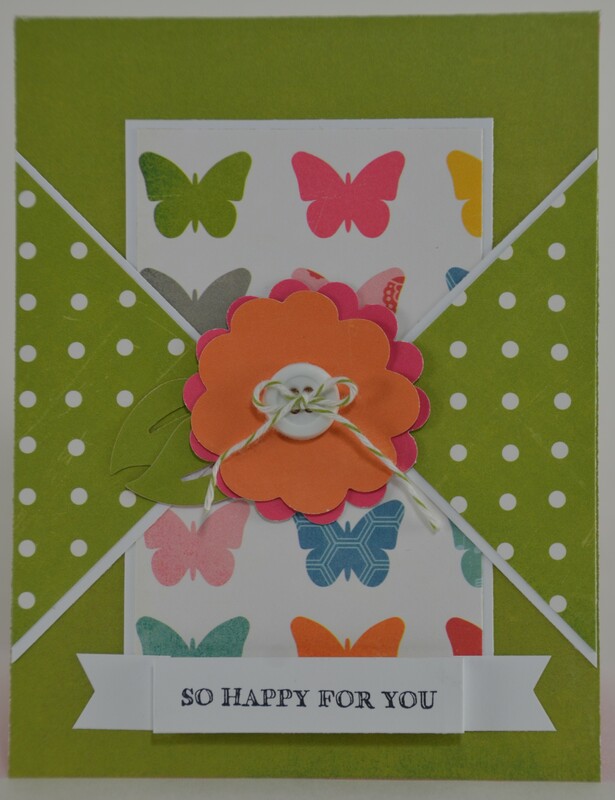 It includes cute paper patterns and stickers…easy peasy! 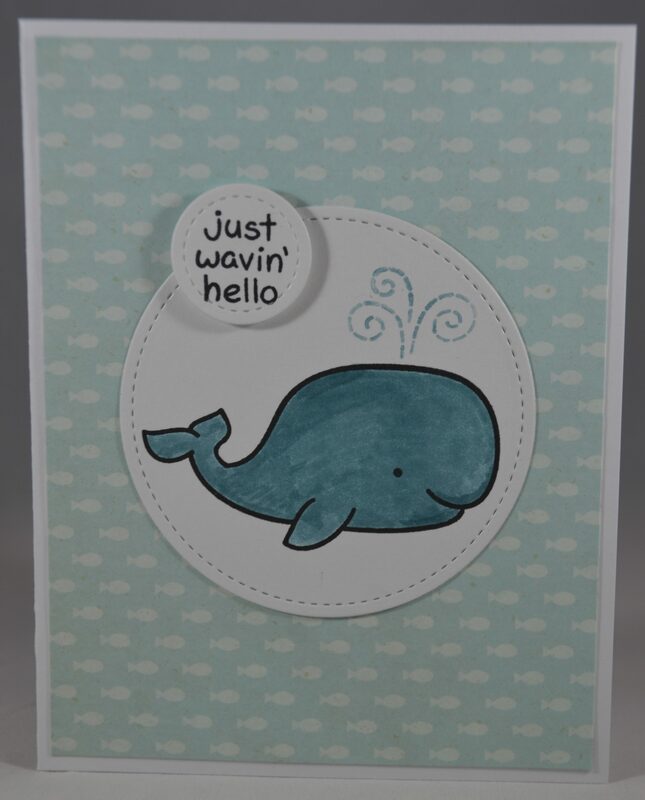 This may look like an ordinary card, but it is quire extraordinary. 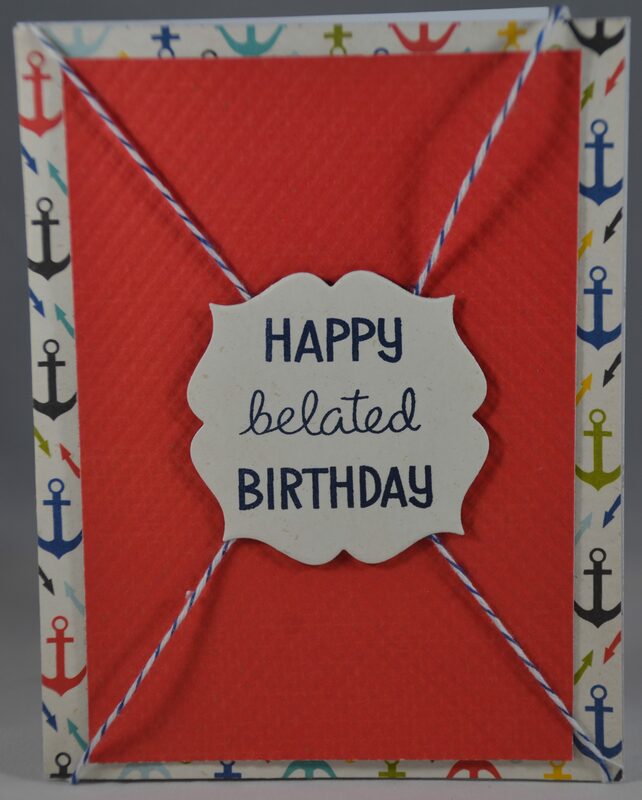 When the ribbon is removed, the card opens to reveal extra space for your extra special message. It you search YouTube, it is known as a Squash Card (like the fruit, except not a fruit 🙂 ). 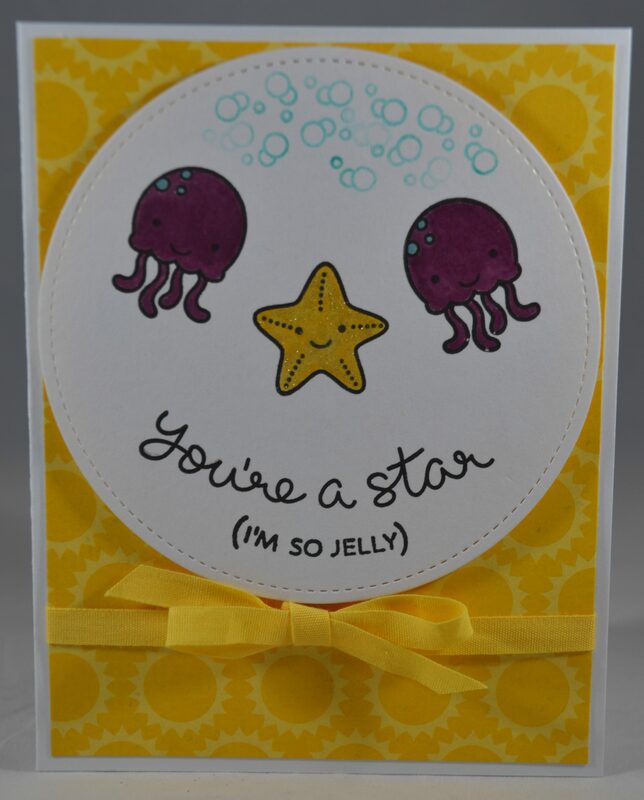 I’ve been wanting to do a starburst card for a while, and once I did it, I realized how easy it is to do. 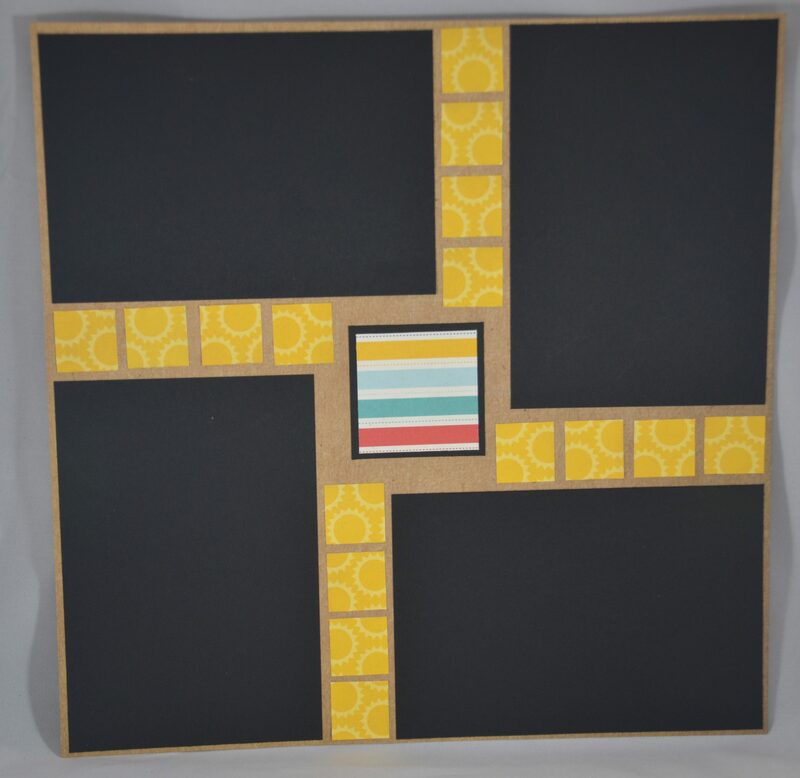 It only involved 6 rectangles cut on the diagonal to create a beautiful, sunny design. I channeled my inner quilter to create this look. It is completed with a special sentiment. Stay tuned for more inspiring inspiration board inspirations coming soon! Here is the last installment of our Winter 2017 Inspiration Board Collection…Enjoy! Oh, how I love these octopuses!! They just had to be on a layout!! 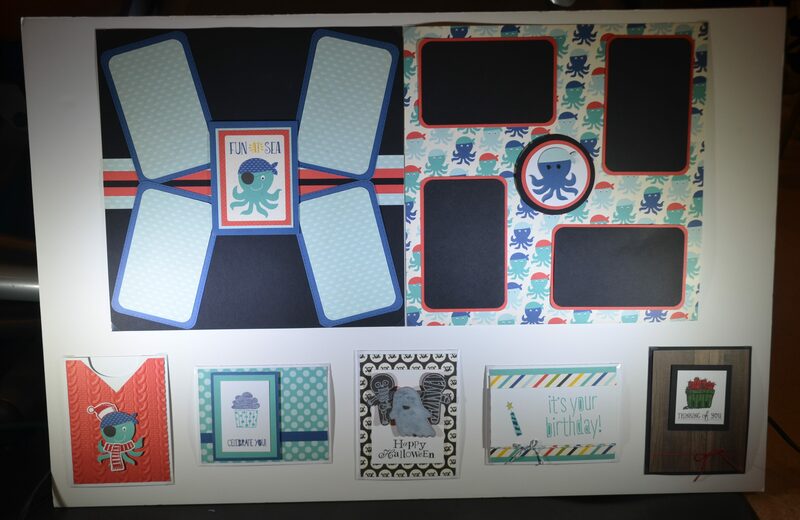 The one featured on the right is made using a TOTES ADORB octopus die…eeek!!!! 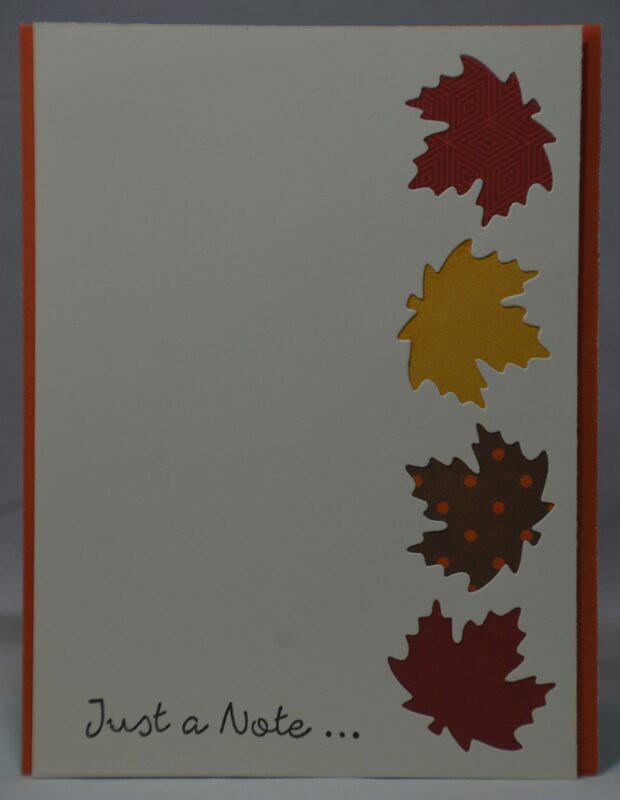 In the previous blog post, a game was mentioned where a holiday was identified and then a card was created from the welcome gift. 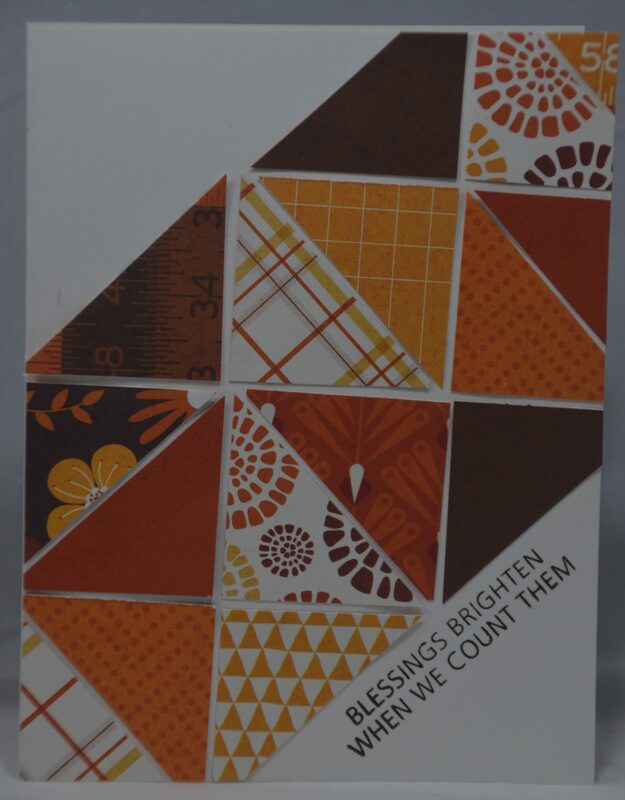 We present….the ugly holiday sweater card!!! Haha! 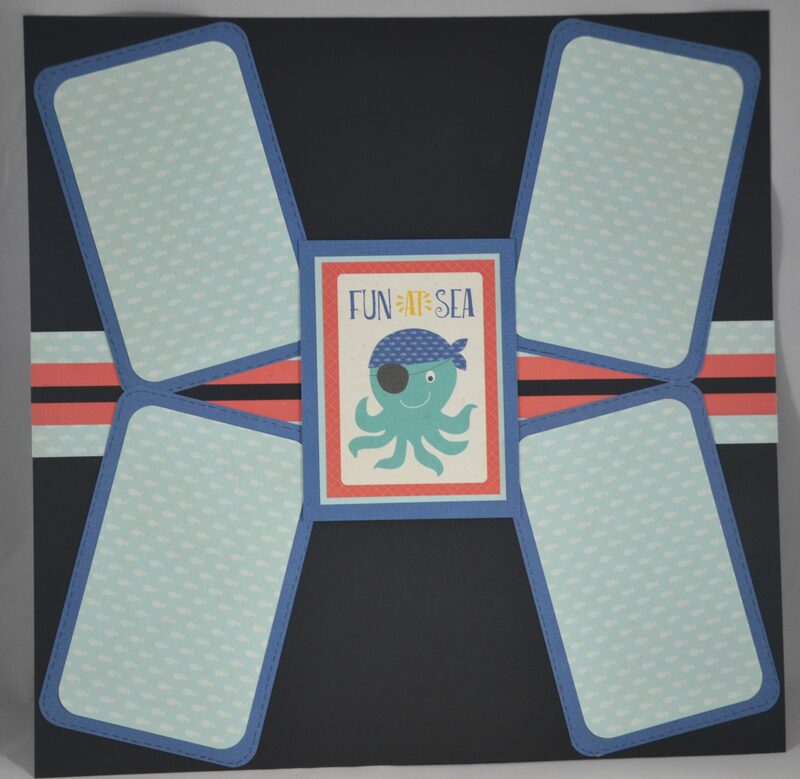 But, the argument for “ugly” is hard to uphold with this adorable little octopus on the front. The sweater was made from the cable knit embossing folder…so fun! 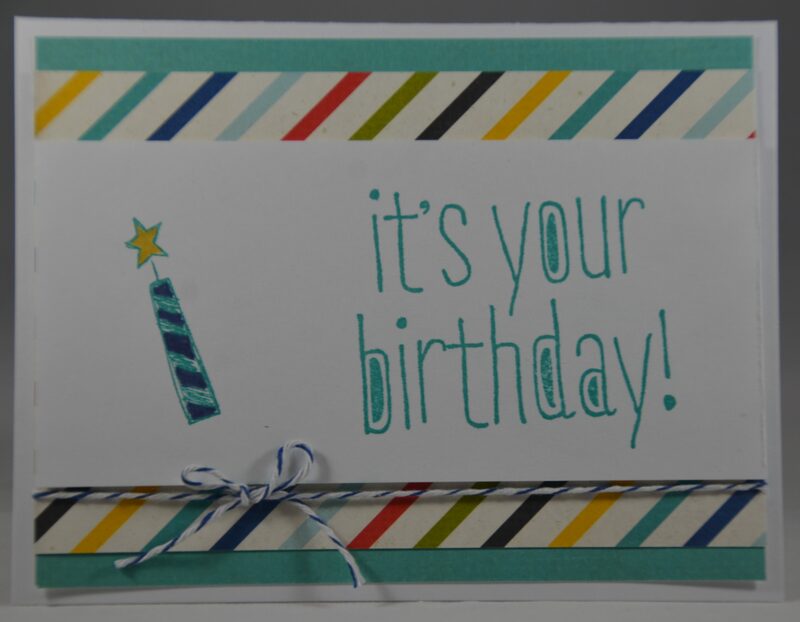 The game continues….BIRTHDAY!! I could not let this welcome gift go by without pairing the blue and teal…such an amazing color combination! The theme of Halloween was given in jest and I was told it couldn’t be done…well look at that! 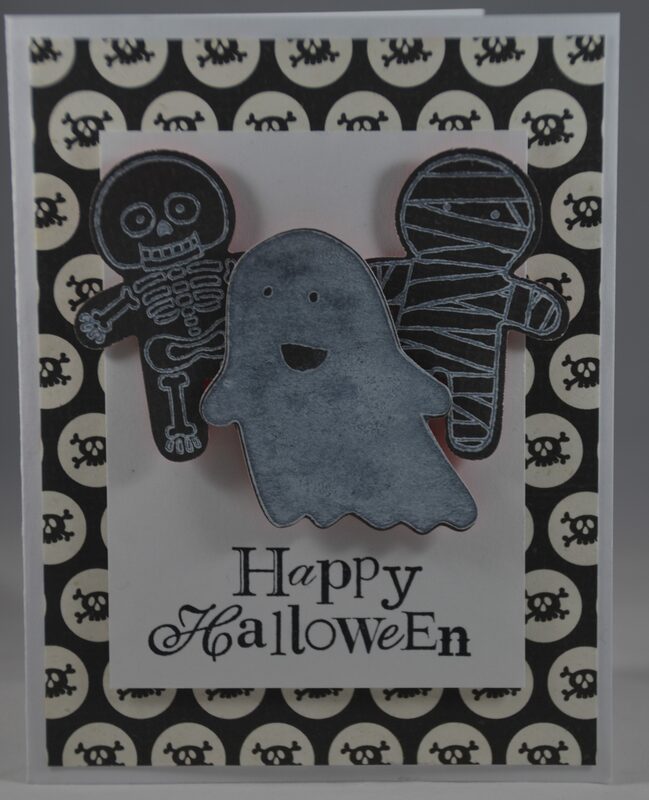 An adorable, spooky Halloween card from paper intended for pirates! 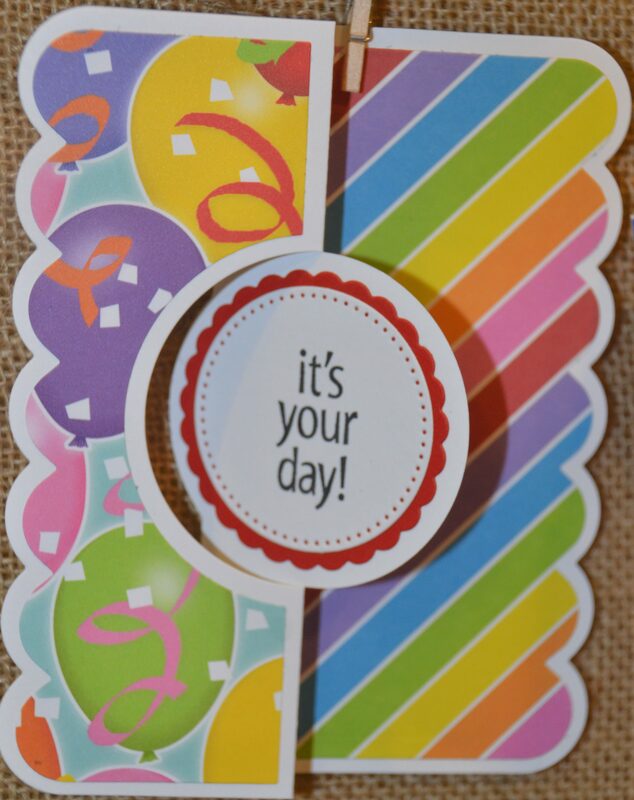 These stripes were calling out to be used for a birthday…Enjoy! 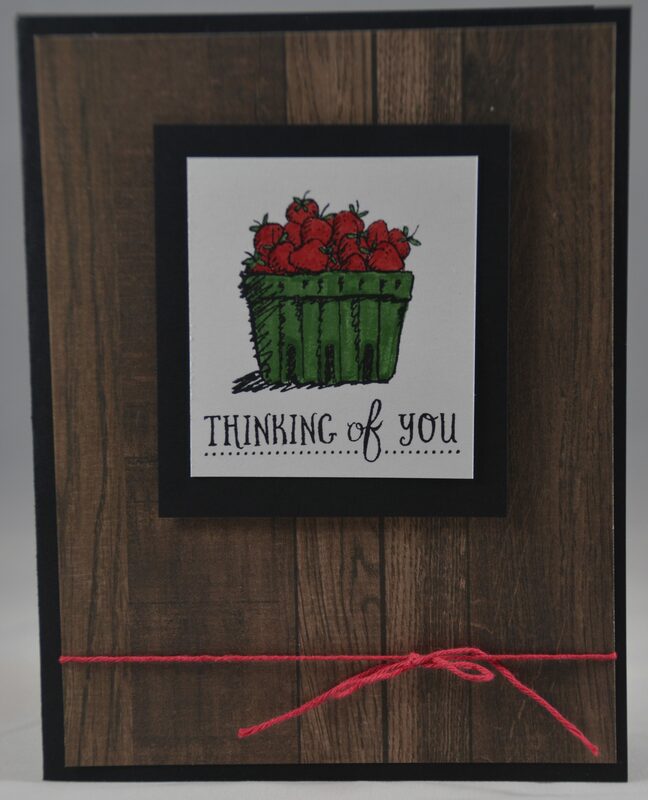 This was actually the first card I made with the paper pack…I just love the hardwood look, especially with a bushel of apples! Here is the next installment of our Winter 2017 Inspiration Board Collection…Enjoy! 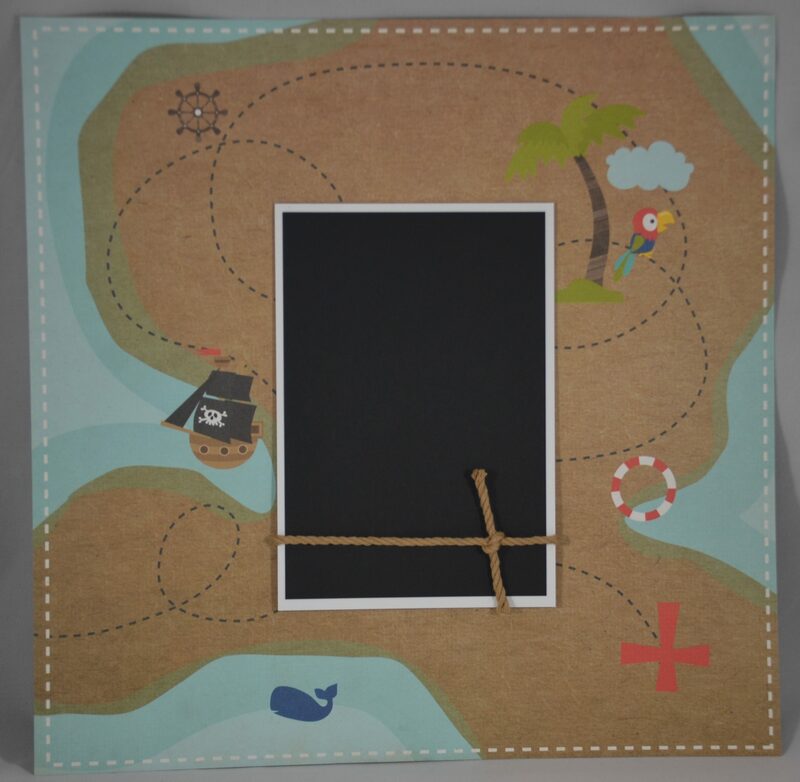 I really wanted to make a layout with the treasure map paper….and adding black and the thick rope seemed like the perfect contrast! 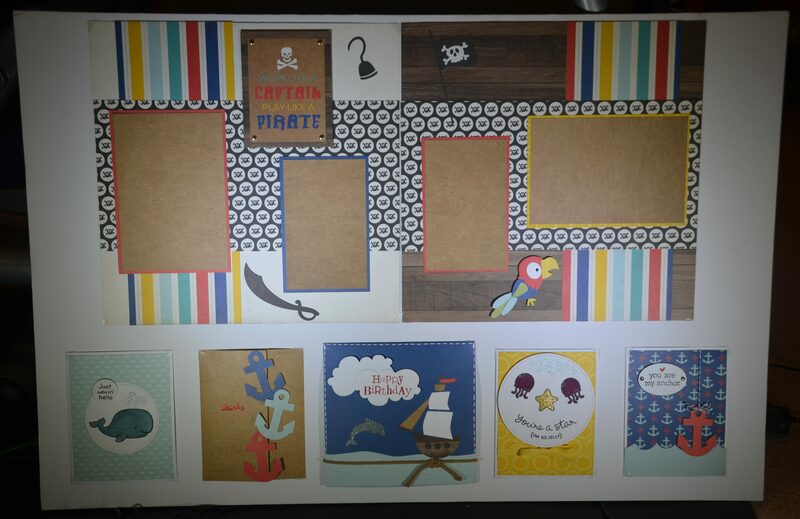 I created a criss-cross shape on the left side to mimic the X-marks-the-spot on the right and feels like the perfect way to highlight the little pirate in your life :). 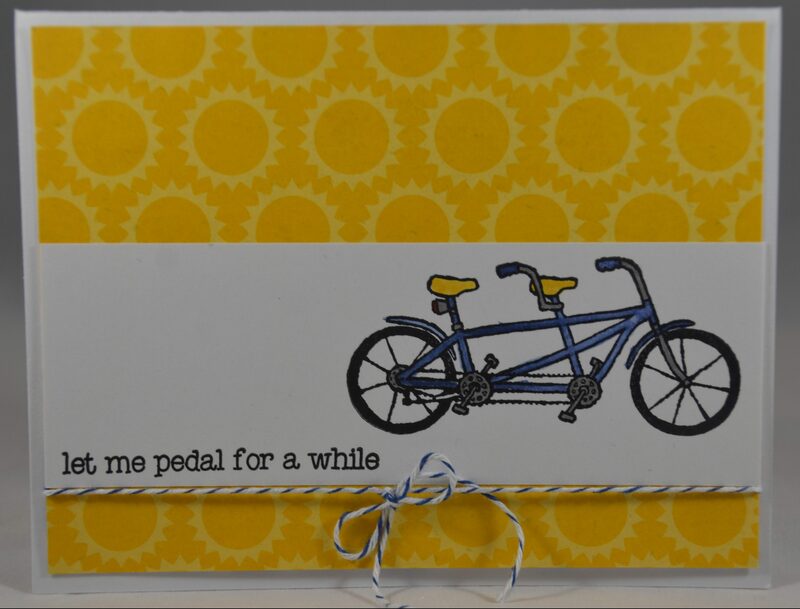 How I adore this card! A simple message for a sweet new one! There have been a lot of unfortunate circumstances in my life lately and I am always looking for encouraging cards to share. This one uses a heartfelt sentiment and image that I colored in with markers. I know this one will bring sunshine to someone’s day! 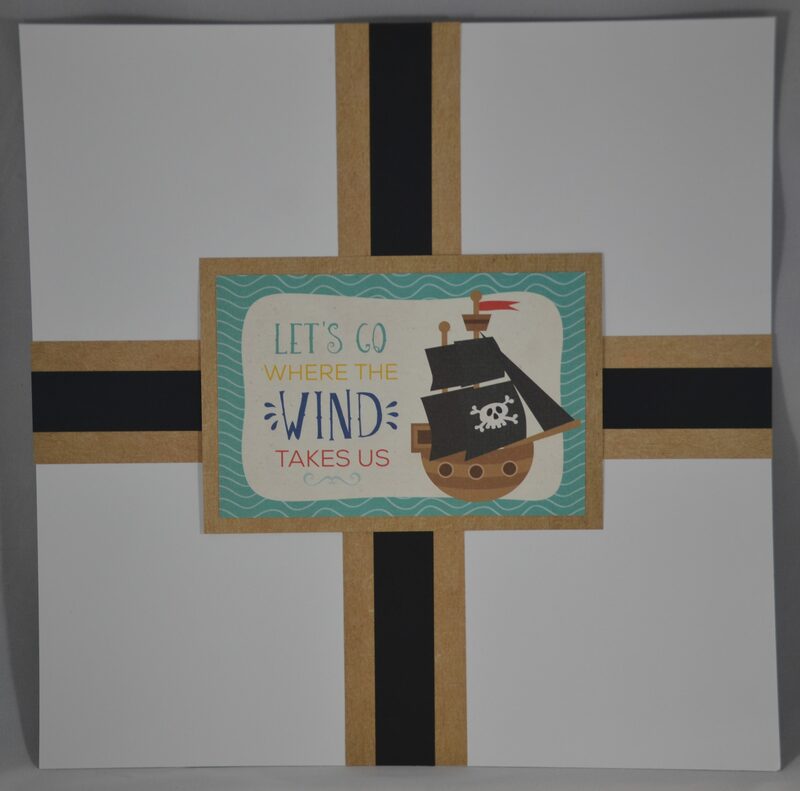 True confessions….I had difficulty coming up with pirate themed cards and decided to stay away from this theme to show the versatility of the paper. 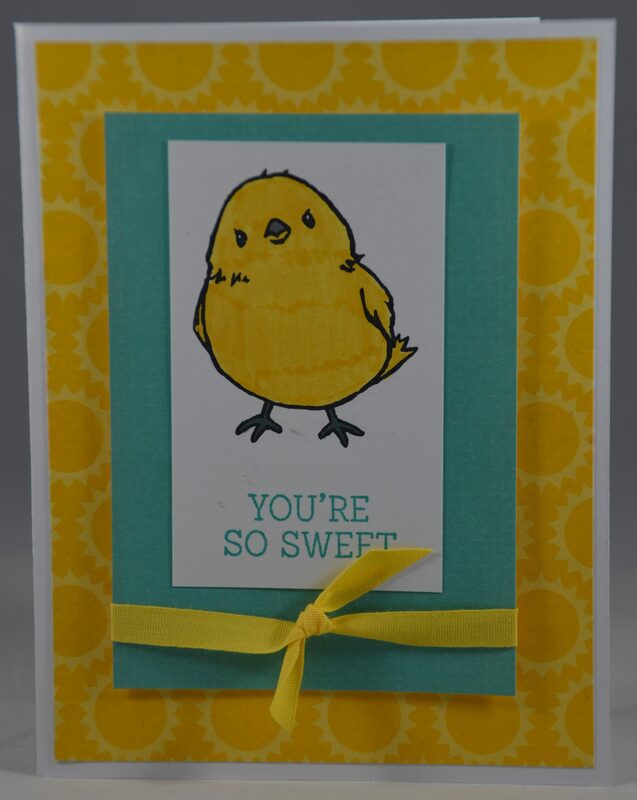 When we were all crafting together, I would ask my friends to call out a random holiday and then I would attempt to make a card using our welcome paper….First up in our game: Easter/spring. 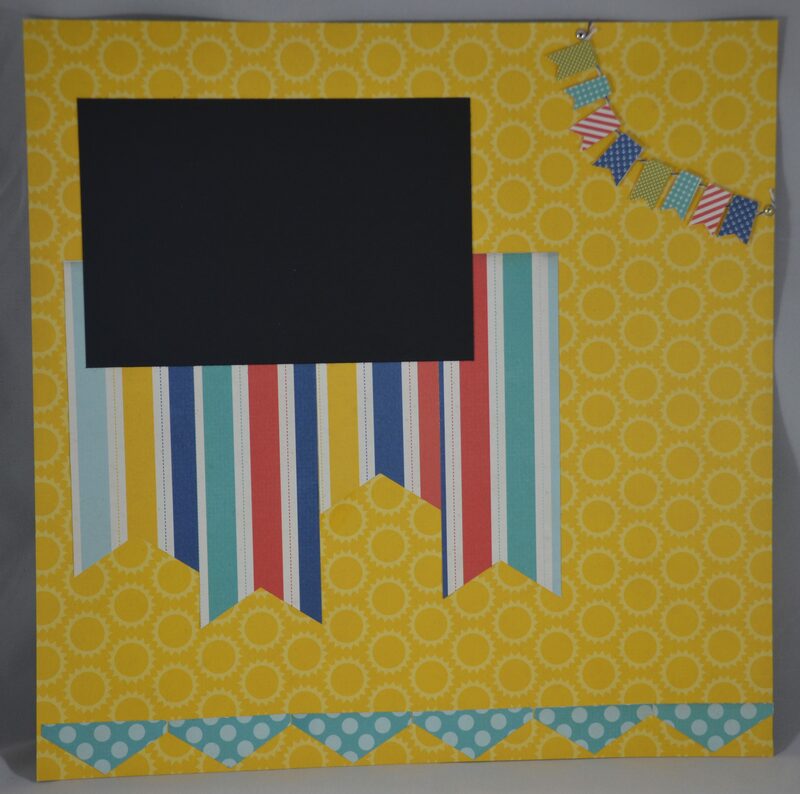 If you look closely, you will notice the black banner goes behind the sentiment card and the teal banner goes in front…Fancy! 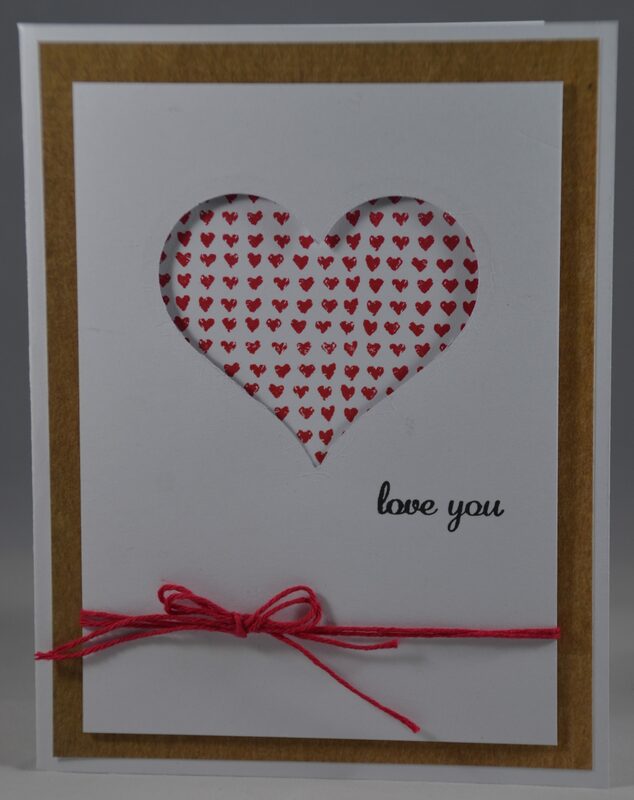 Next up in the game was Valentine’s Day/love…and I ended up LOVING this card. Fun and simple! 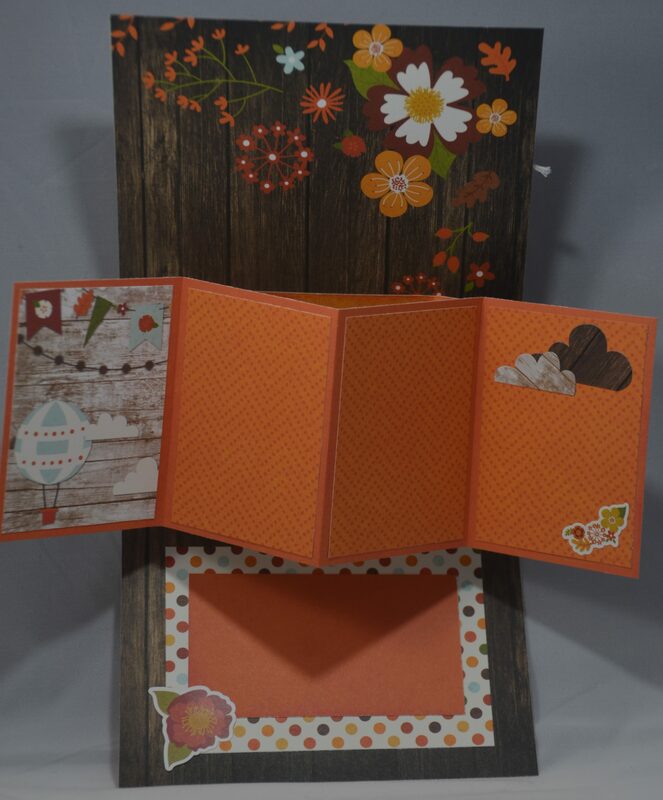 I loved using the hardwood paper as the background for my layout! 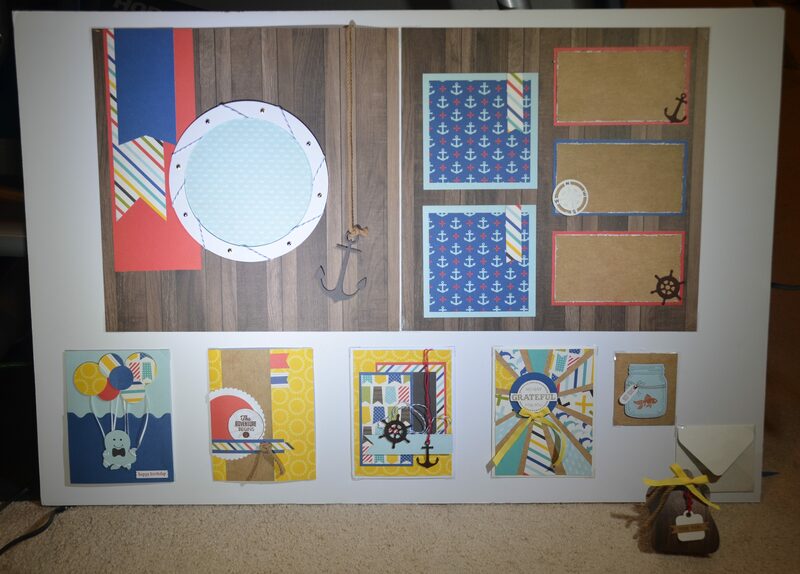 The anchors, compass, and wheel add nice nautical touches, but I must say, my favorite part is the porthole! Those brads were the perfect addition. My handsome little octopus is all dressed up and ready to party! 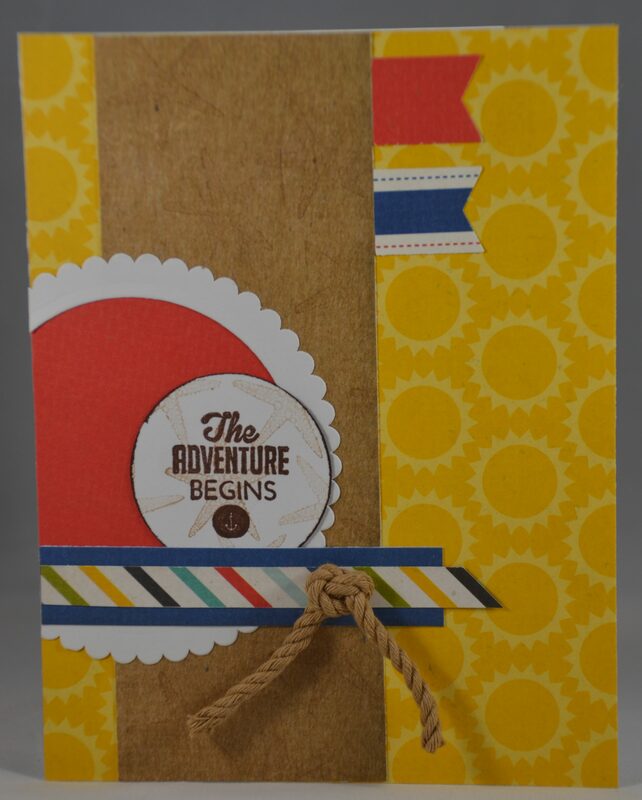 I think this sentiment would make the perfect card for someone who is starting a new job, graduating, or maybe moving. 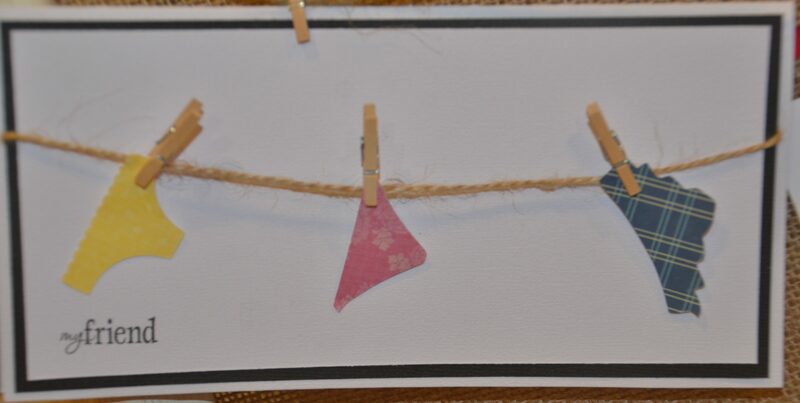 I have seen this design on Pinterest projects before, but haven’t attempted it, until now! It was really pretty easy! It starts with four rectangles that are cut across from opposite corners. 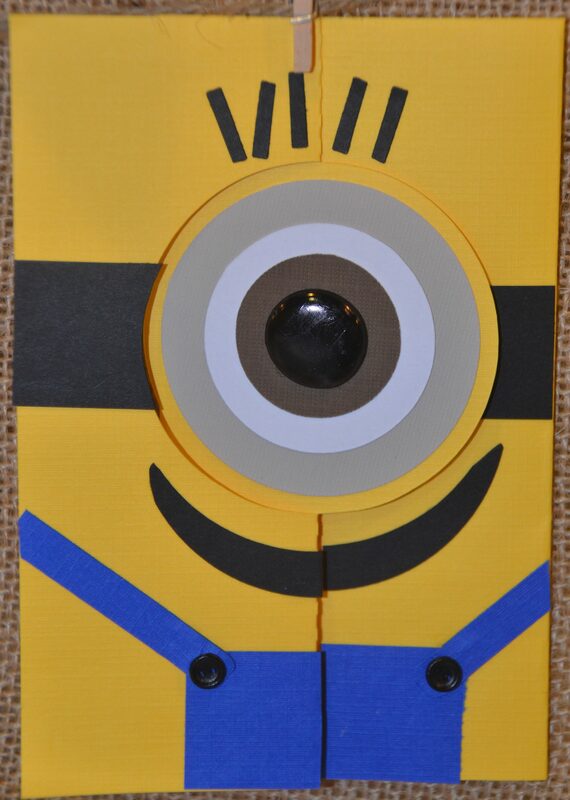 Then you arrange the pieces to meet up under an off-center circle, and cut off any extra paper that hangs off the edge. Best Fishes. Still cracks me up! 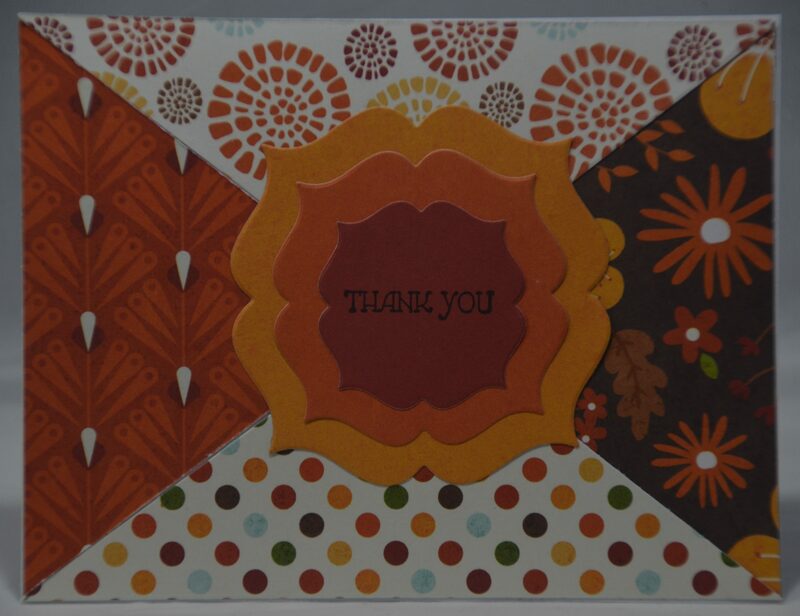 🙂 And of course, I had to use my envelope punch board to make a coordinating envelope! I just had to get a 3-Dimensional project in here! 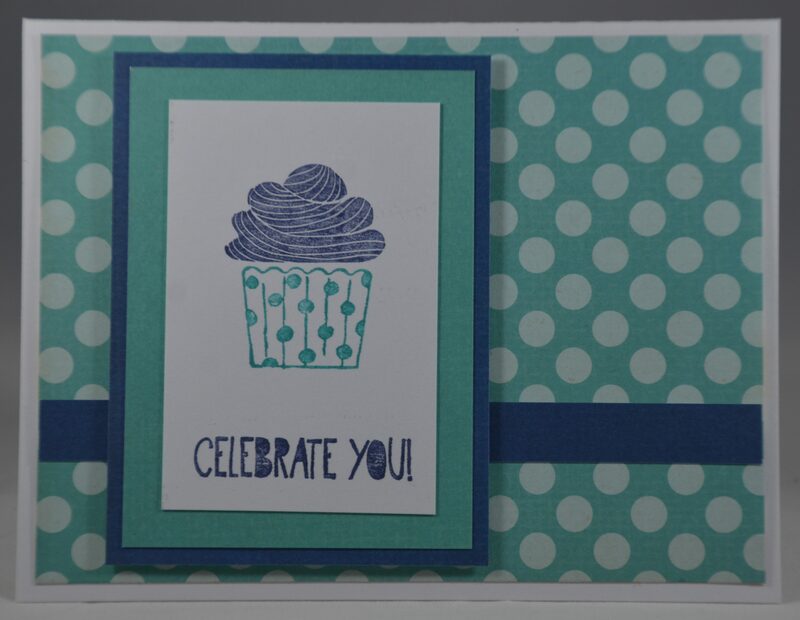 It was really quite easy, thanks to the Stampin’ Up! 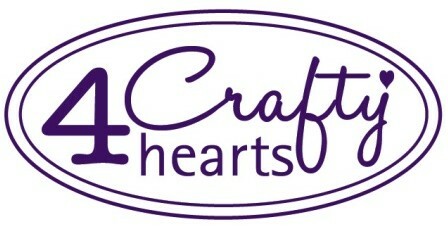 Keepsake Box Die. 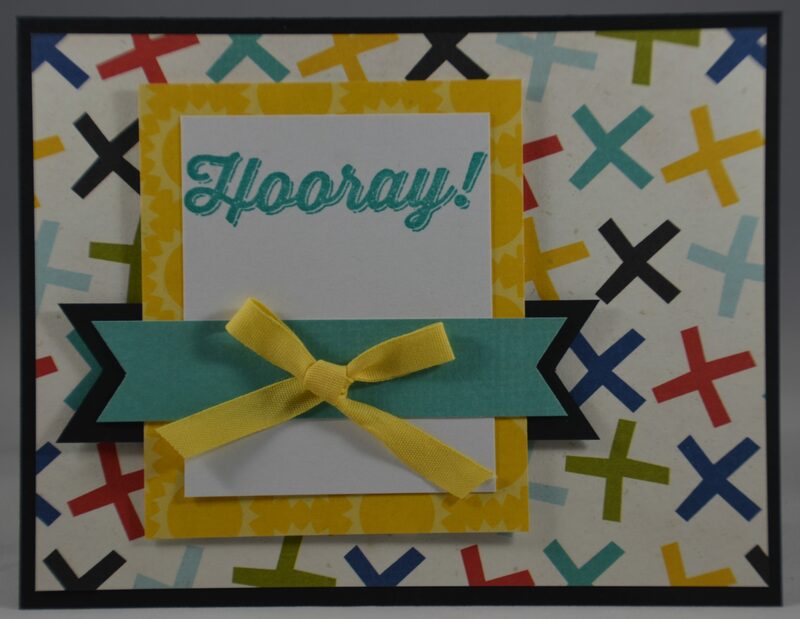 Add a little tag, a few embellishments, and voila! 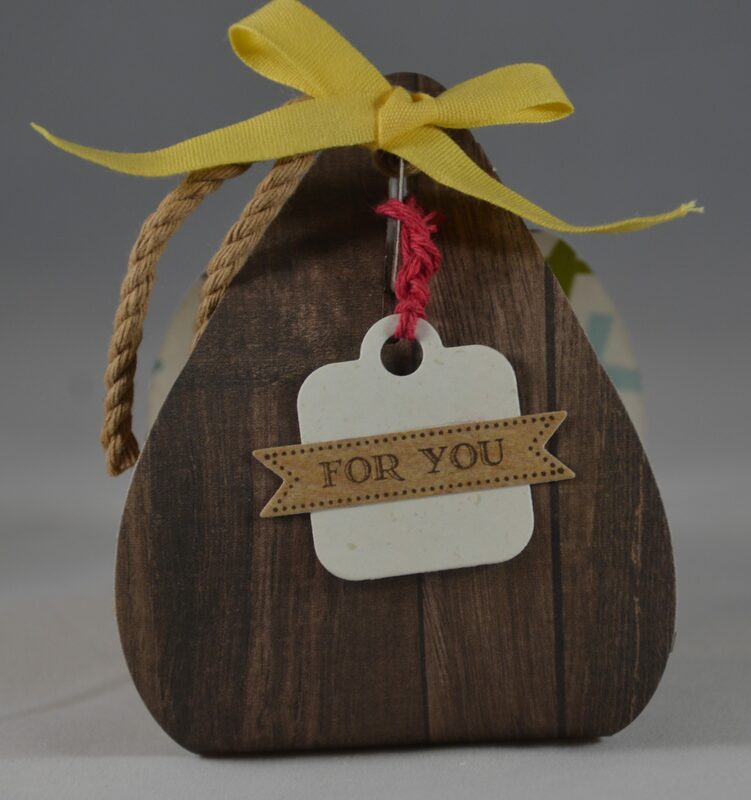 A cute way to give someone a little treat. I got the idea for these pages from other layouts, but then I made them my own. 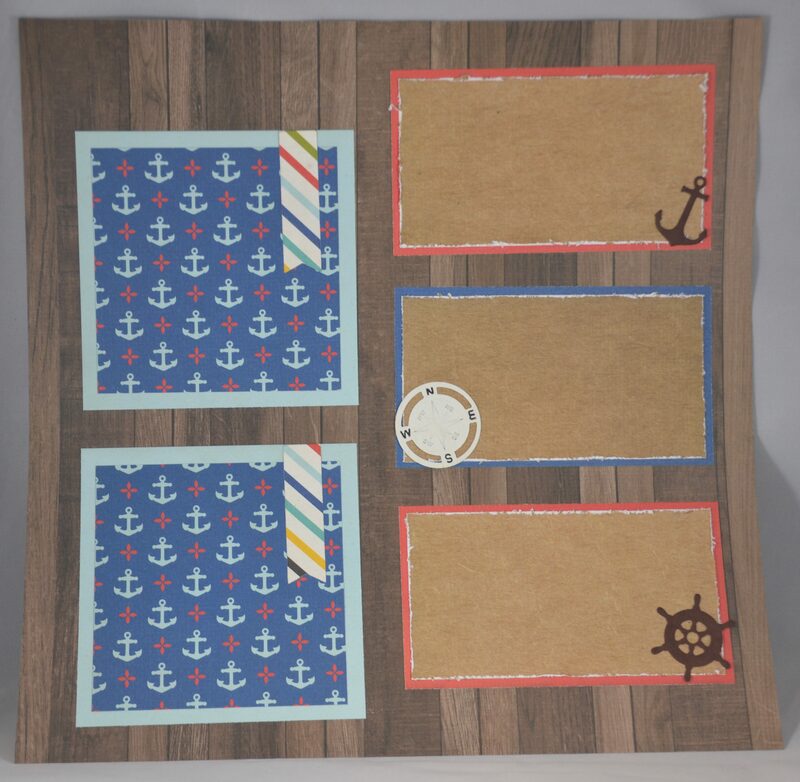 I wanted to make a banner with the twine, but wasn’t sure what to use for flags, then I realized I could cut the flags from the pirate flags and hang them as a banner. I love the background paper, and really like the way the pages tie in together. I tried to make some of the cards tie in with the layout. I really liked the stripes, can you tell??? 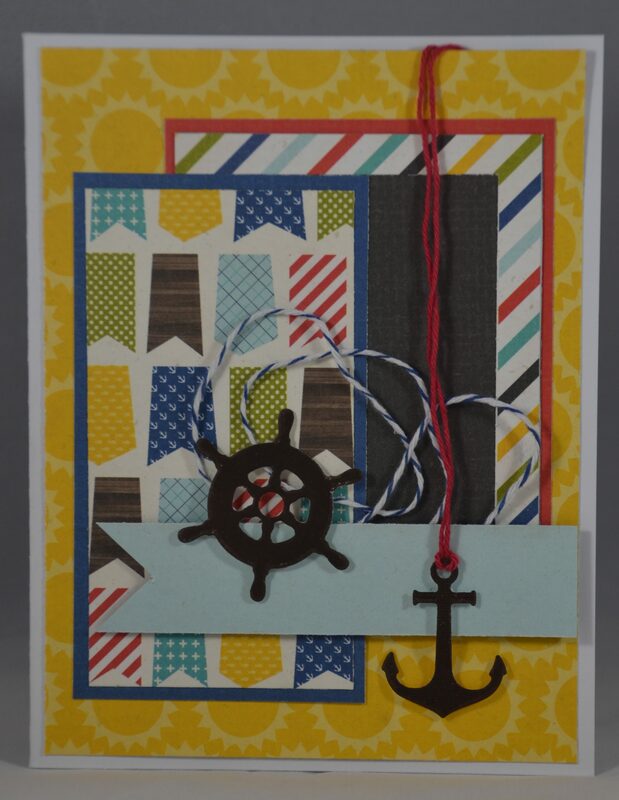 I really liked using the twine behind the card’s saying which I have done before on horizontal cards, but I decided to try and use this idea on a vertical card. 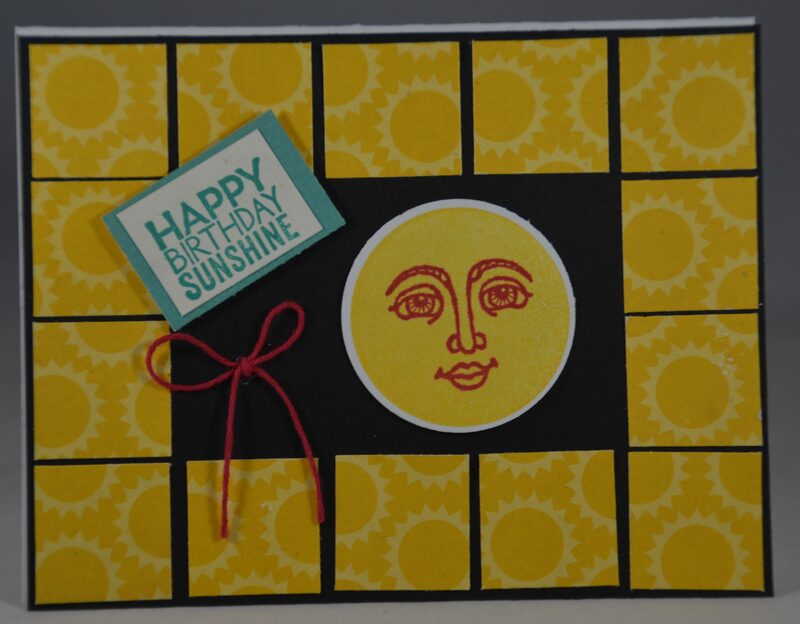 I love this card with the idea taken from the squares on the layout. I knew I wanted to use the sun face and what better place to put it! This card just came together so nicely! 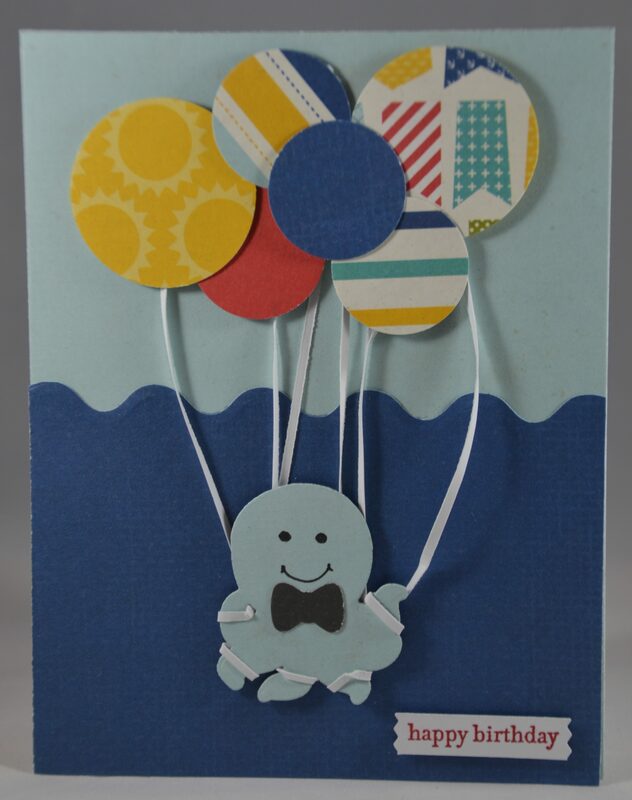 I really love it when the ideas for my cards are all my own!!! This started as triangles and then I just added the center piece. Once I was done it still needed something. 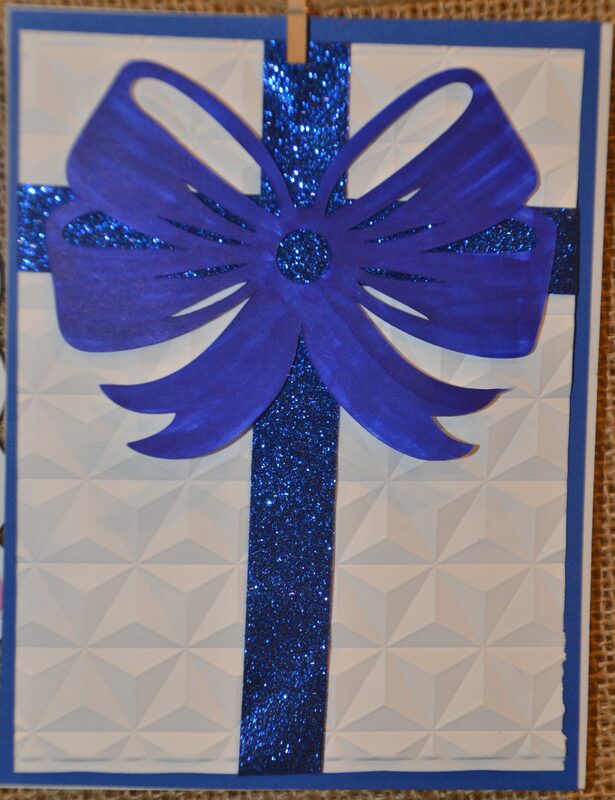 Since I have trouble with bows I needed to do something with the ribbon and just crossing it over worked really well. 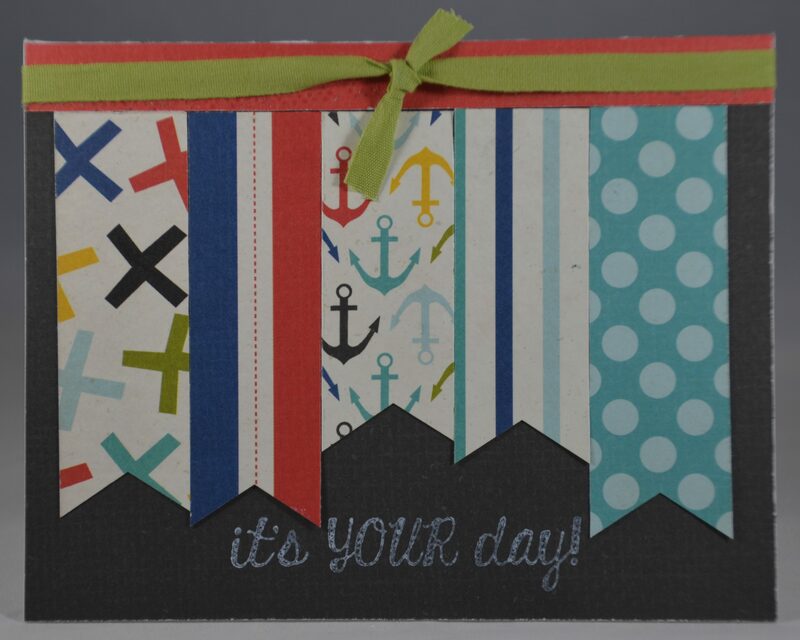 I was able to tie in the flag borders from the layout with this card. I also used as many patterns of paper as I could! When I got to the end I still needed a stamp, but where to put it without taking away from the flag??? Oh, right I could use white ink on the black! Yay!! Enjoy more of our creations from our Winter 2017 Getaway! 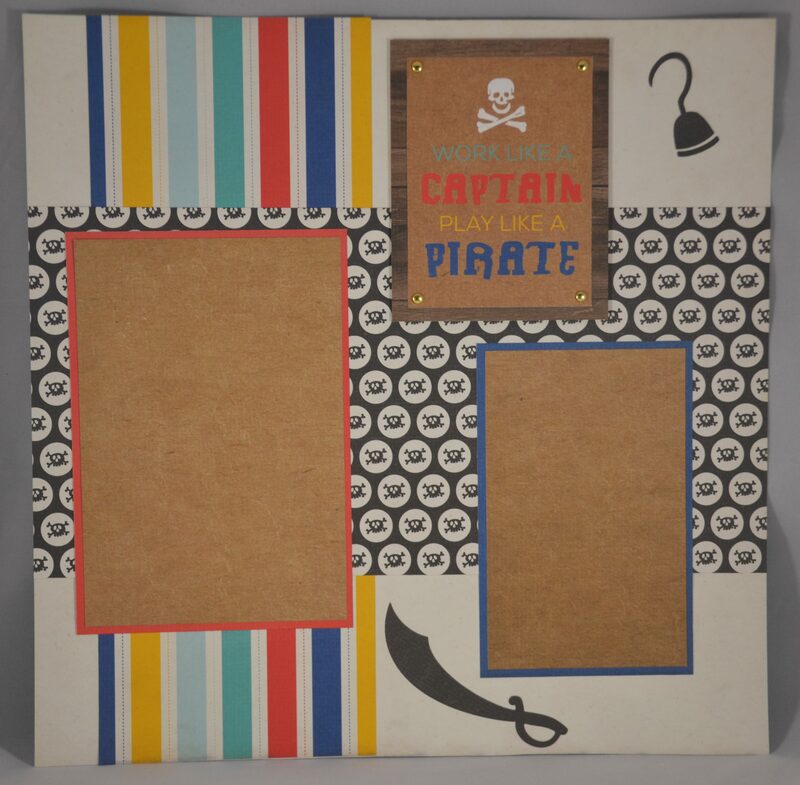 Work like a Captain, play like a pirate! I love the Echo Park Designer Dies on this layout. 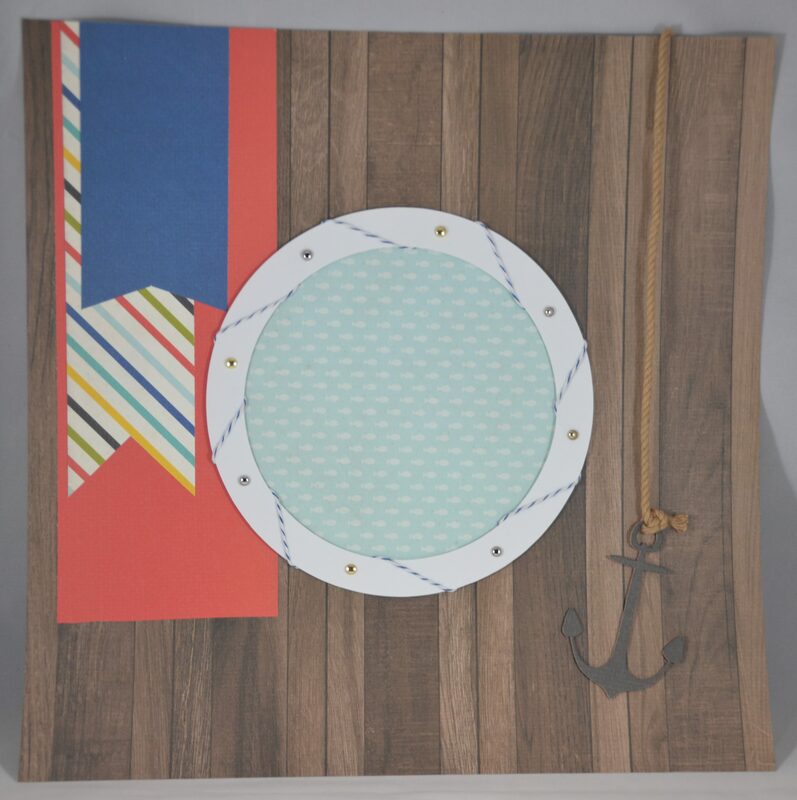 The pirate flag is adorable and was quick and easy to do. The parrot…adorable! Not so easy… There are a lot of pieces to the parrot, but the end result was worth it! 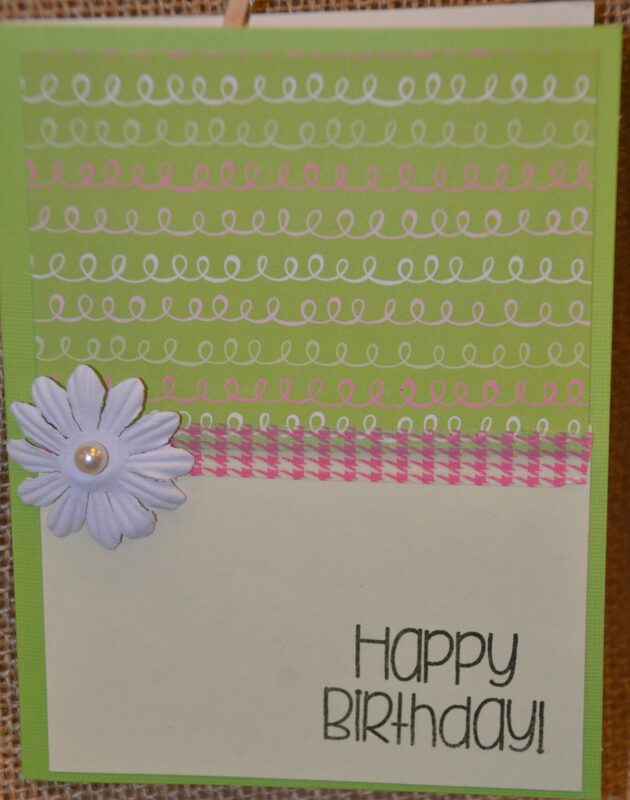 The Lawn Fawn Stitched Circles framelits add just the right touch to this simple card. 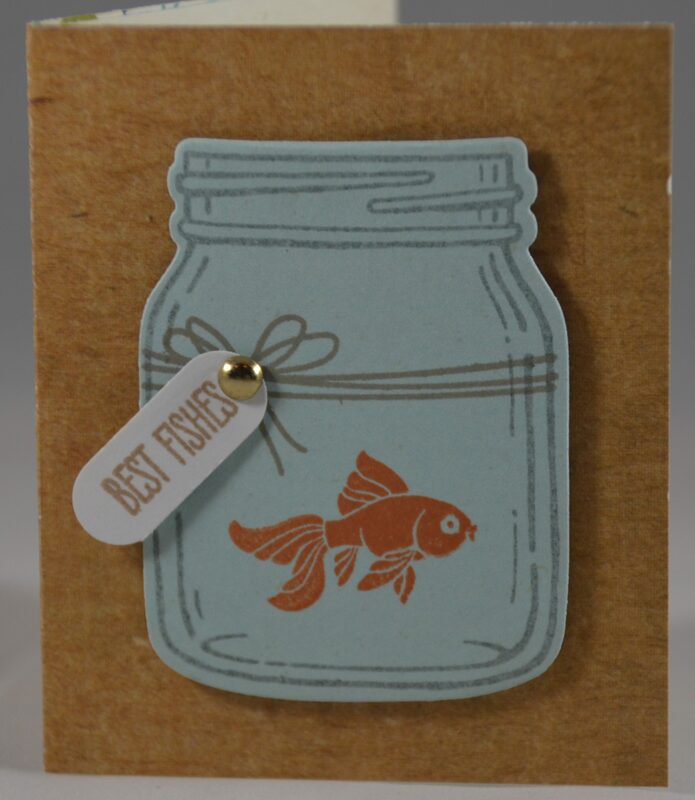 I had to hold back from adding more fish from the Lawn Fawn Critters in the Sea stamp set. They are all so cute, but I wanted to keep it simple. 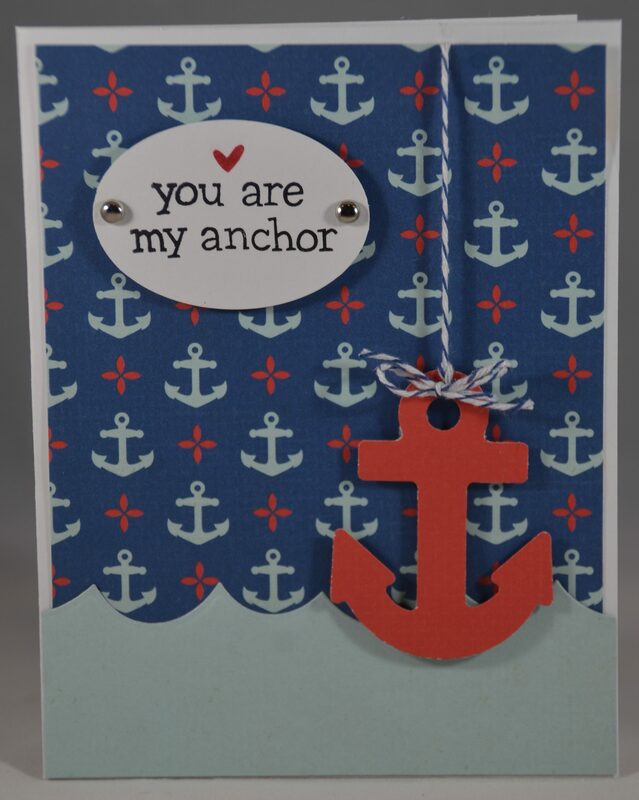 It’s hard to tell in the picture, but the anchors are overlapping to close this asymmetrical card. 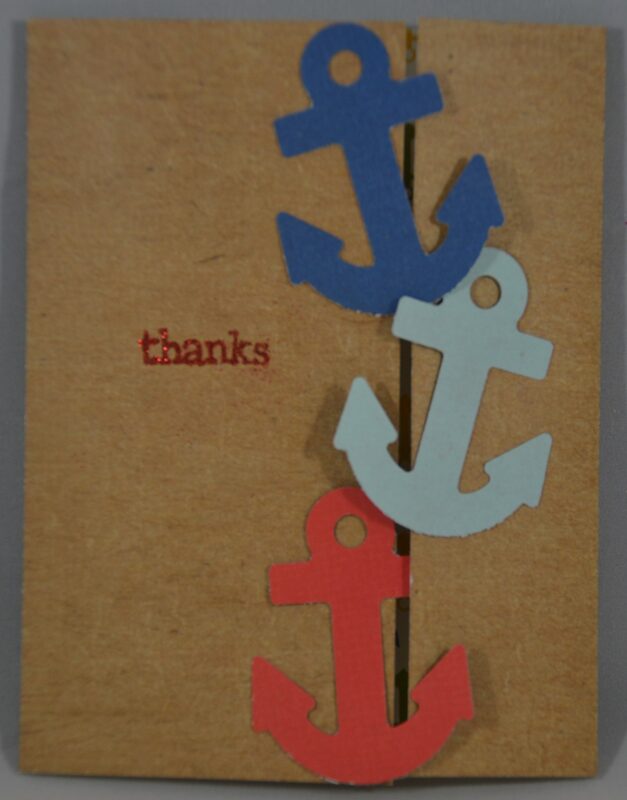 The inside of the card has little anchors covering the paper. 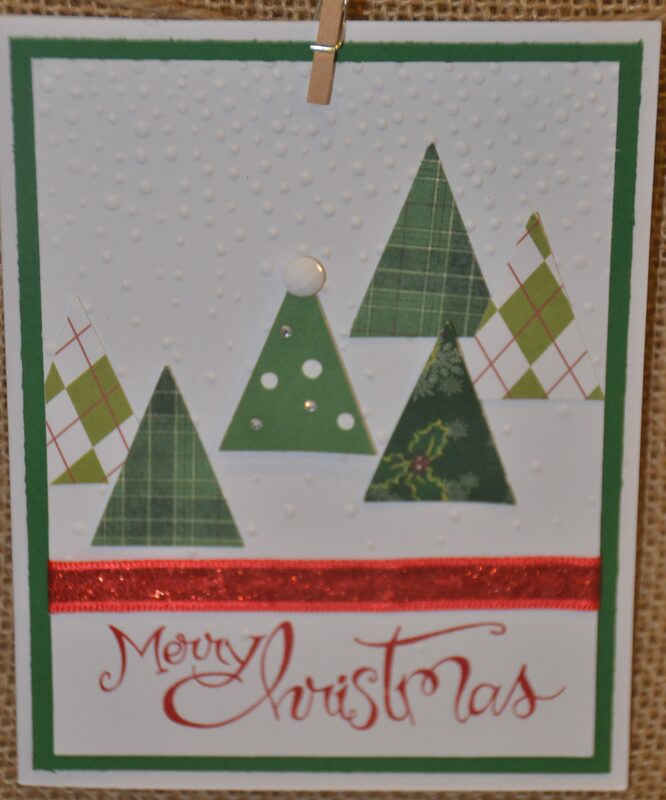 I attempted to do glitter embossing for the word thanks, but it didn’t seem to emboss. 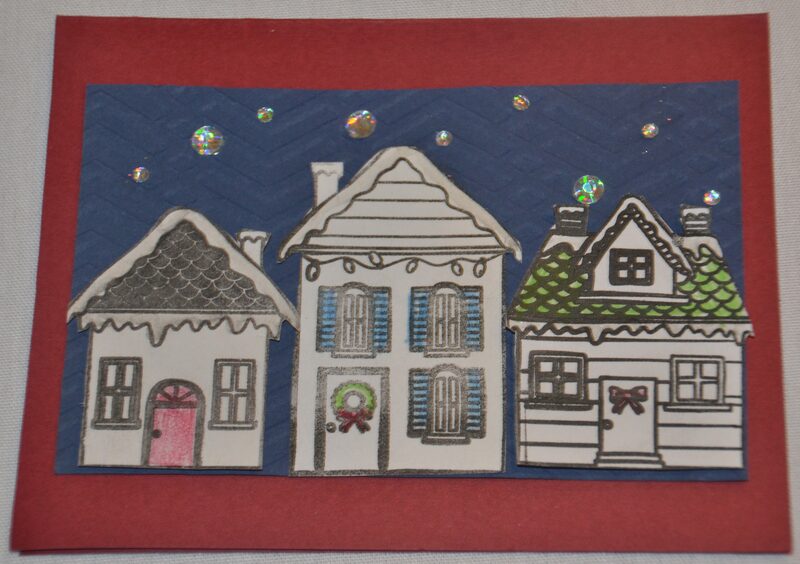 It was my first time using glitter embossing powder, so maybe I need more practice! The magic of this card is the inside! 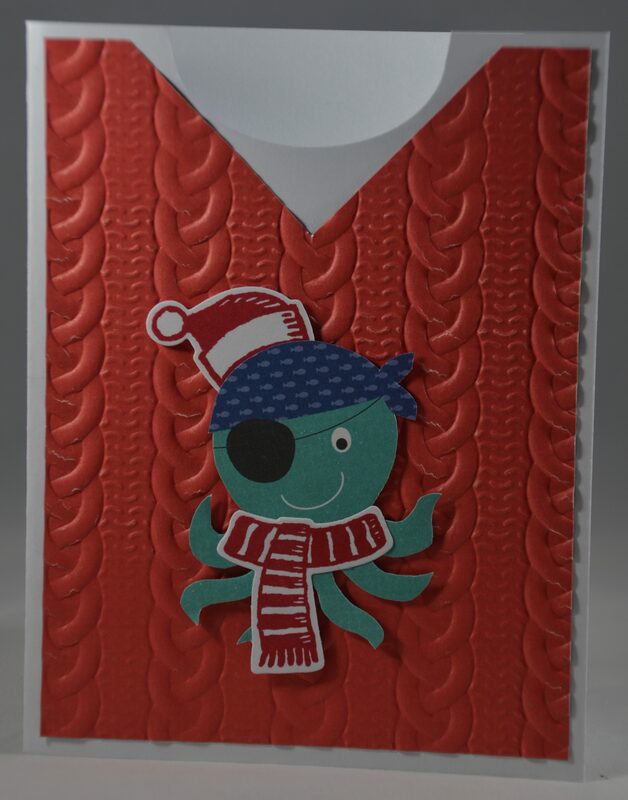 I used an entire 12 x 12 sheet of paper with a pirate treasure map for the inside of this card. I used a Turkish map fold. (Look it up on Pinterest or YouTube to try it!) It was tricky with such thick paper, but the end result is so cool! 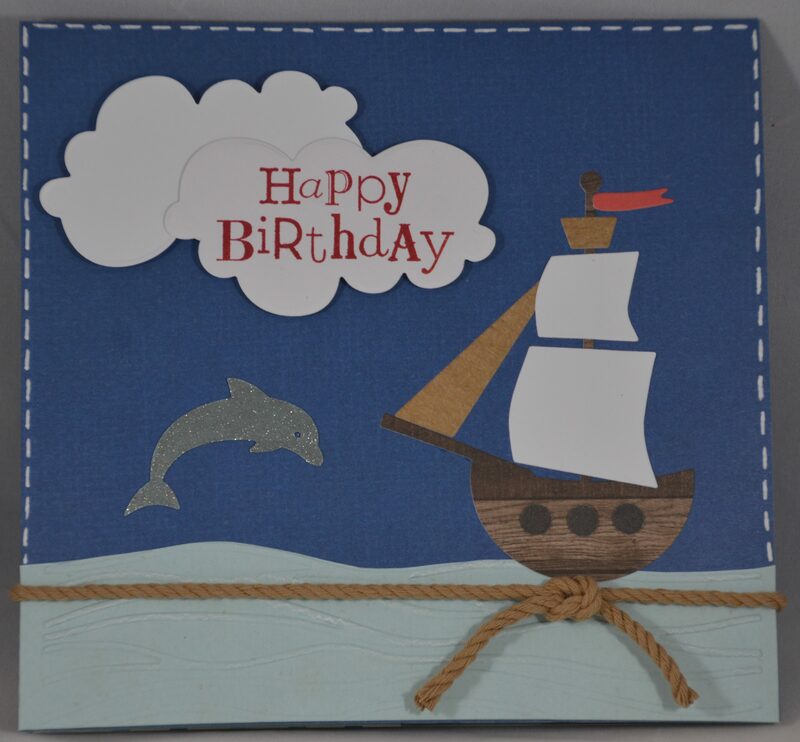 I had fun with more of the Echo Park Designer Dies to make the ship and the dolphin. I wish I had inked the edges of the clouds to give them more depth, but I added the white dashes at the end to finish the look.